When it comes to shopping for furniture, you want to be sure you're buying for style and longevity and not just because something is "on trend". For most of us the furniture we buy is an investment, so you want to know what you're buying will last. 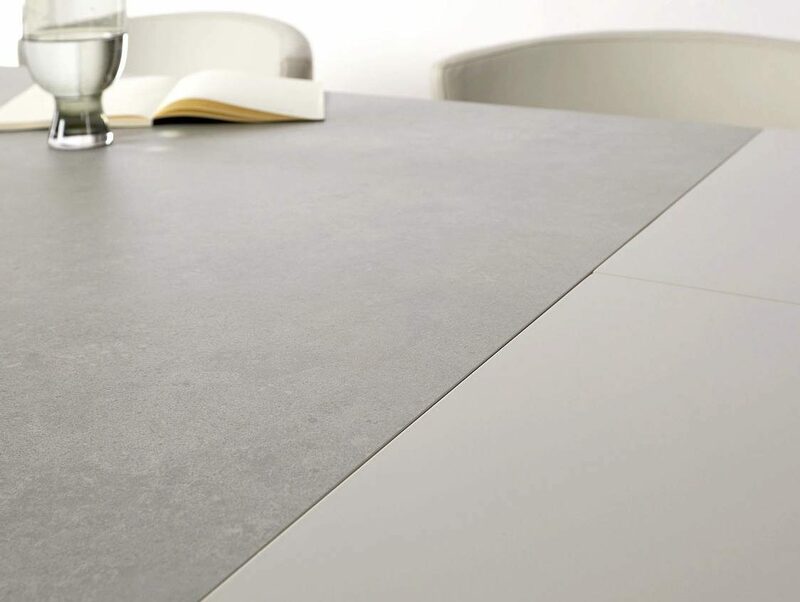 With that in mind, we would like to show you our new Aria Grey Oak range. 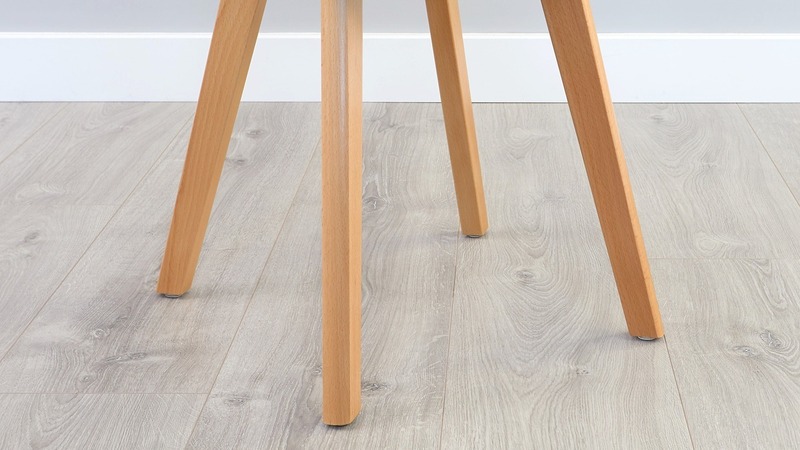 Made from a grey oak laminate, this hardwearing and practical range is perfect for busy family homes, and for timeless interior style. Historically laminate has been seen as a less desirable material. However, due to modern technological advances, it's really hard to tell the difference between laminate and real wood furniture. What's more, the easy cleaning and low maintenance of laminate furnitue make this the perferred option for busy family homes. 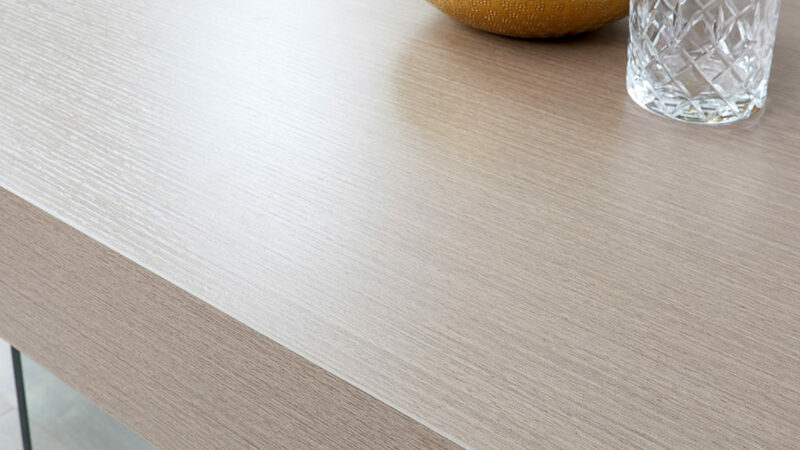 Wood Laminate is made from synthetic materials layered on a solid base, such as MDF. To give the look of real wood, a grain is printed with clear, textural layers added on top to give a very realistic wooden look and feel. Although not solid wood, a wood laminate is actually much stronger and harder wearing than real wood which requires regular maintenance. With a wood veneer you get the look and feel of real wood, without the high maintenance. Cheaper than real wood, making more affordable for families wanting the look of real wood, without splashing out and signing up to regular maintenance. More colour options than real wood, due to the printing process. 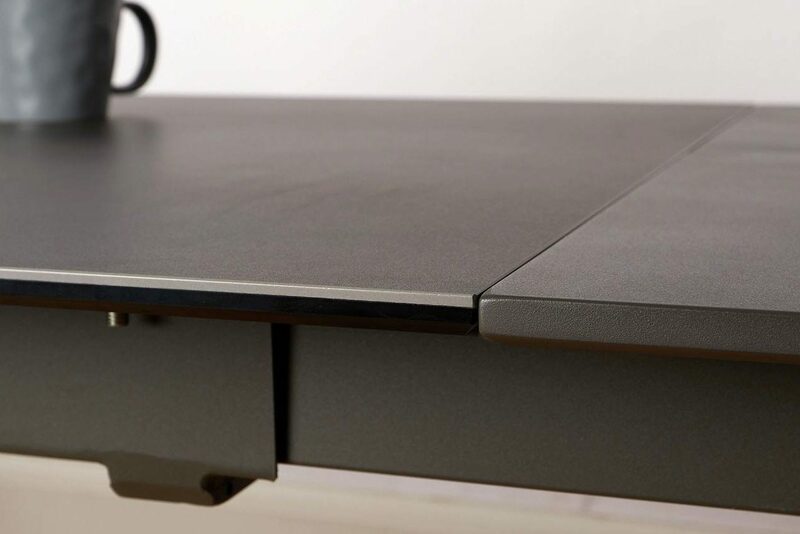 The Grey Oak colour is much easier to achieve through laminate becuase of the printing process. Laminate allow you more choice of colours to suit your interior style. Guaranteed stability. Unlike real wood, laminate are not prone to splitting or warping when subjected to different heat sources. This makes it the perfect material to use in homes with central heating. Low Maintenance and easy to clean. As laminates are much more durable, they require much less care and cleaning than real wood. 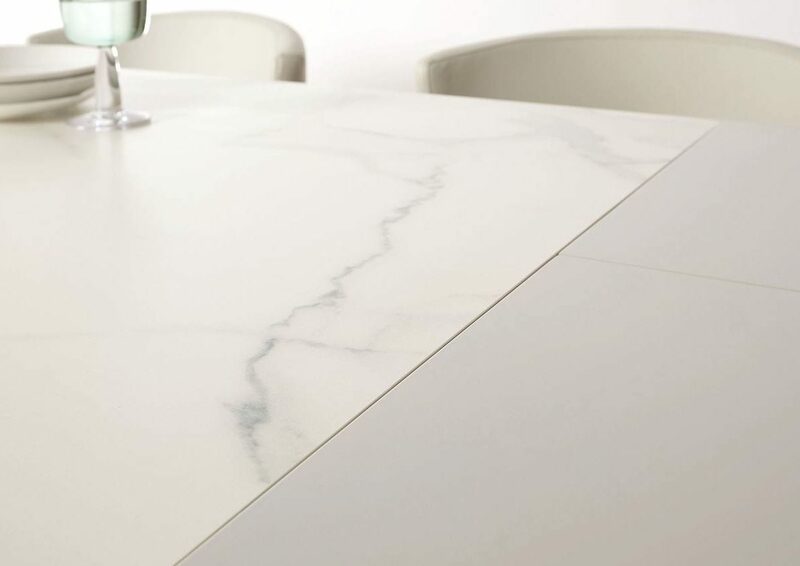 You needn't worry about sanding back and re-sealing like you would with real wood, instead you can clean your surface regularly with warm soapy water without the fear of warping or damage, making laminates ideal for families. Less longevity than real wood. As with most raw, natural materials, they will last longer than man-made materials. That said, if cared for properly your laminate furniture will last a reall long time and look as good as new, where real wood can show more signs of wear and tear. Prone to water damage if not properly protected. Overtime if water seeps under the surface of the veneer it can cause it to bubble and crack. Our wood veneers are protected with a sealant to stop this from happening. Less refurbishing options. 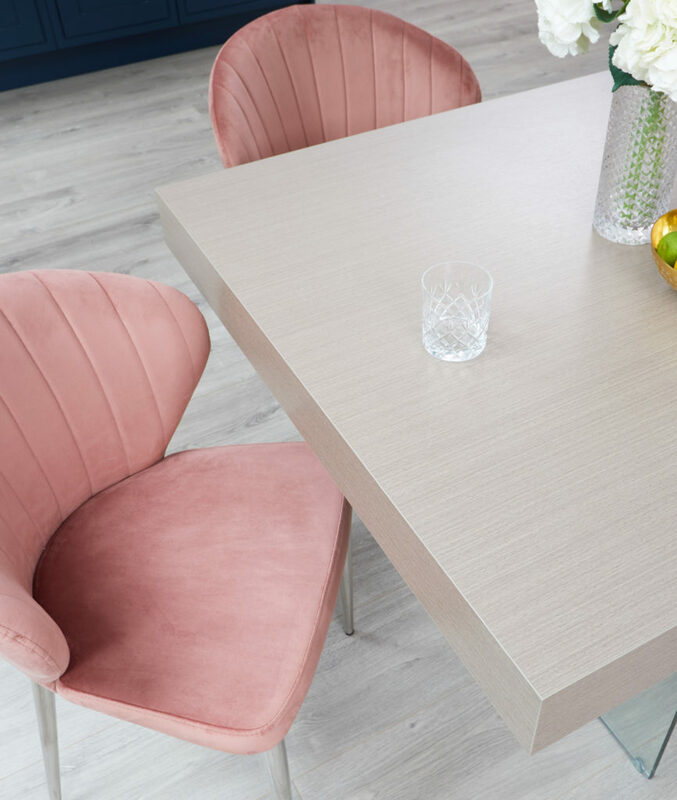 We are all partial to a bit of up-cycling from time to time, however, with laminate furniture, this is not possible due to its synthetic nature. That's why buying a piece which is neutral and unlikely to date is key! Cleaning and caring for your wood laminate furniture couldn't be easier. As with all furniture, it's key to catch any spills as soon as they happen to keep your furniture looking its best. 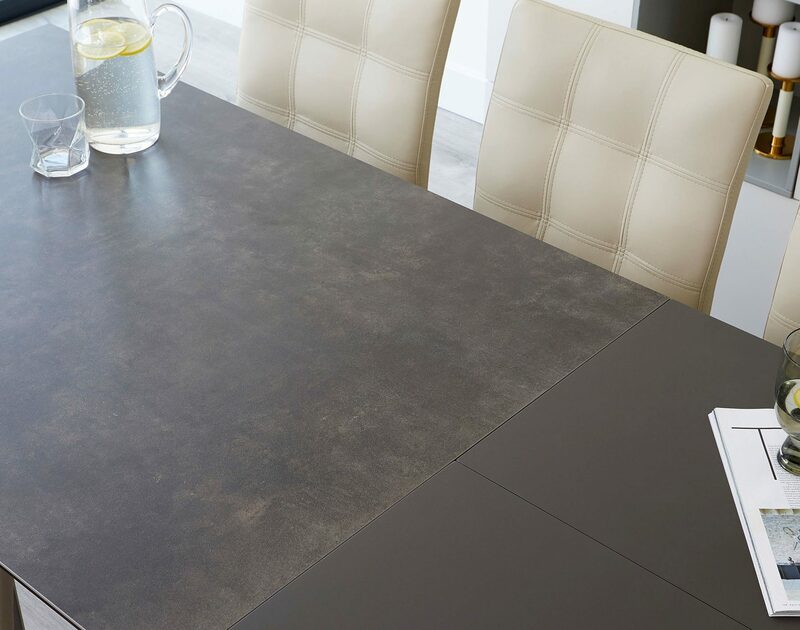 For daily care and cleaning, we recommend dusting down the table top with a clean microfibre cloth. For any sticky marks, use mild soapy water and a clean cloth. Be sure not to get too much water on your tabletop, and dry any water with a clean (and dry) microfibre cloth. For more stubborn marks, avoid using any aerosol or oil-based polish, as these can leave marks. Instead, stick to a solution of water and dish soap, adding a very small splash of vinegar... It really couldn't be easier to care for your wood laminate furniture. Top Tip: Be sure to use coasters and table mats and catch any spillages as soon as they happen. 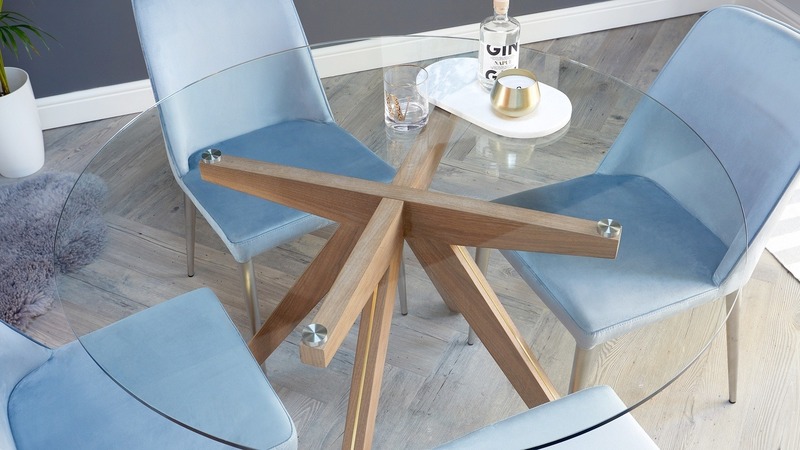 The Aria Grey Oak Dining Table is super versatile and will happily sit within all manner of different interior styles. 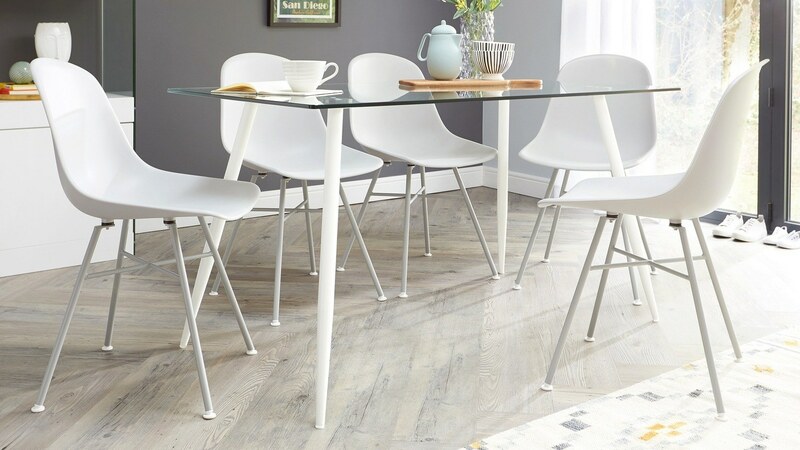 By pairing a thick, wood effect laminate table top with sleek glass legs, you create a light and fresh look to your home. 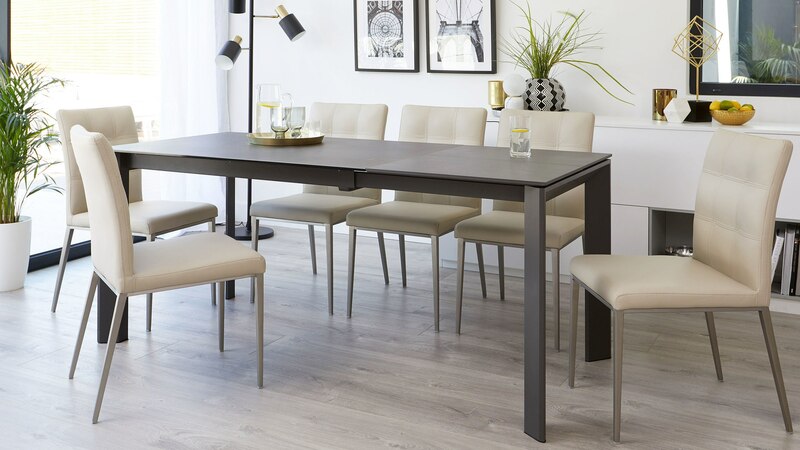 For a more relaxed, chic look, pair the grey oak laminate and glass dining table with a soft velvet dining chair. 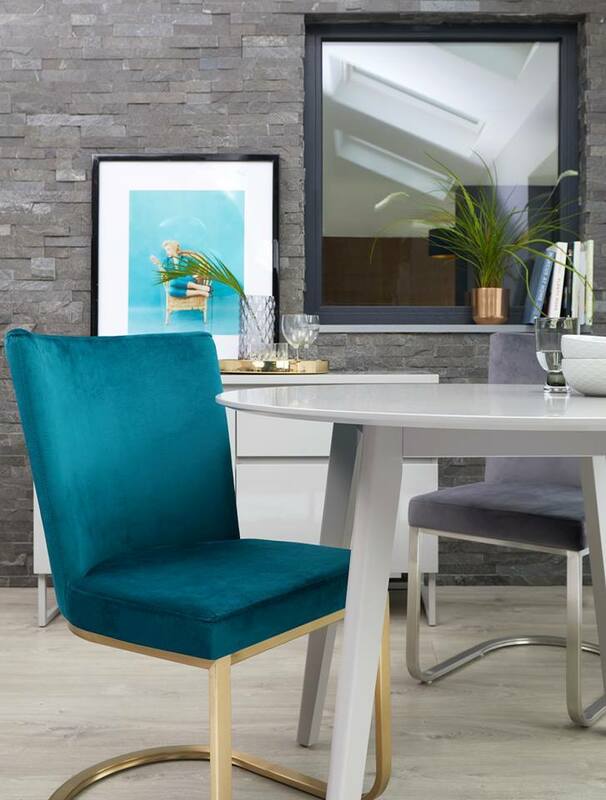 The Harper Velvet dining chair is perfect for this look due to its curved seat and chrome legs. 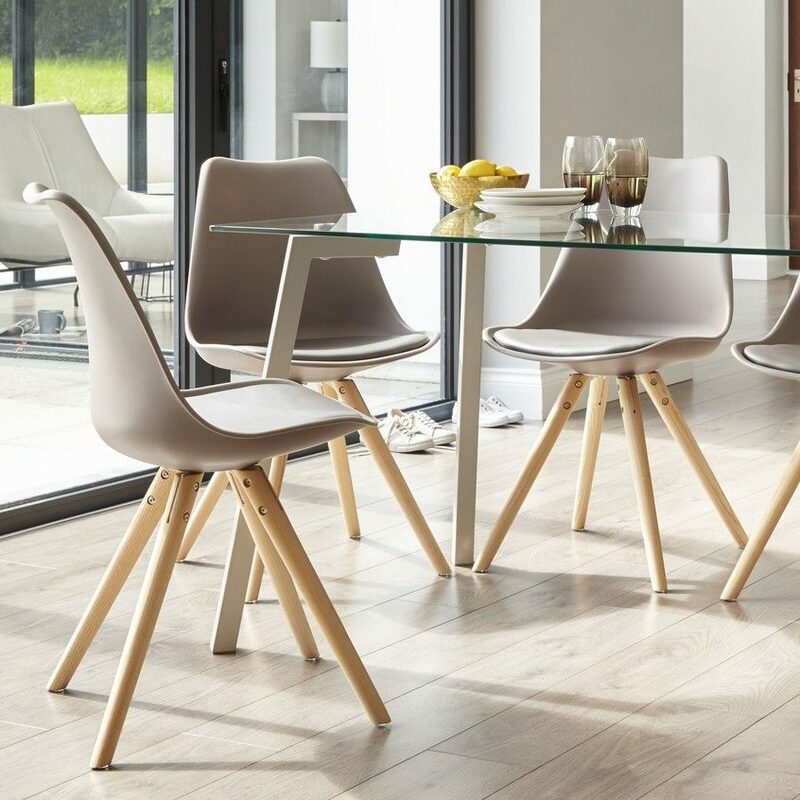 The curved back of the Harper chair balances out the angular table, softening the space and creating a relaxed, inviting setting. Stylists Tip: Mix and match reflective finishes with matt textures, like the velvet and the grey oak. This will stop your home feeling too twee, and give a real designer edge. 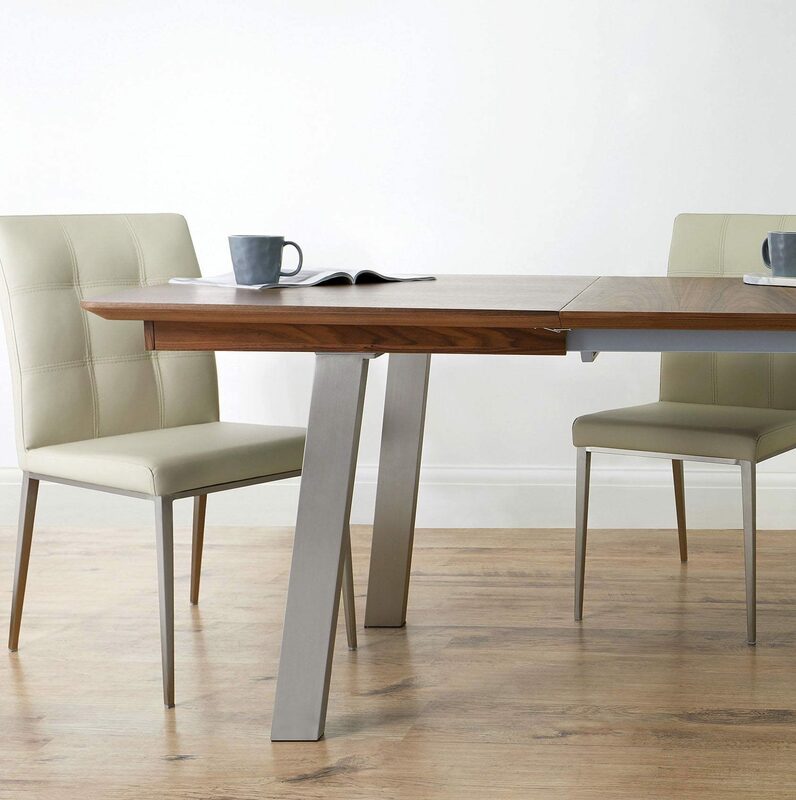 Alternatively, for a more modern luxe feel, pair the Aria Grey Oak dining table with a faux leather dining chair. 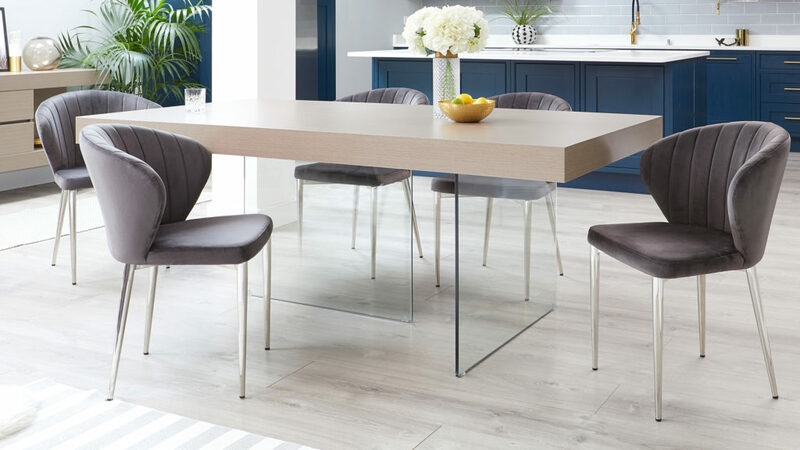 The Theo Faux Leather Dining Chairs create a modern luxe look but balancing the hard glass and grey oak with soft shapes and matt finishes. 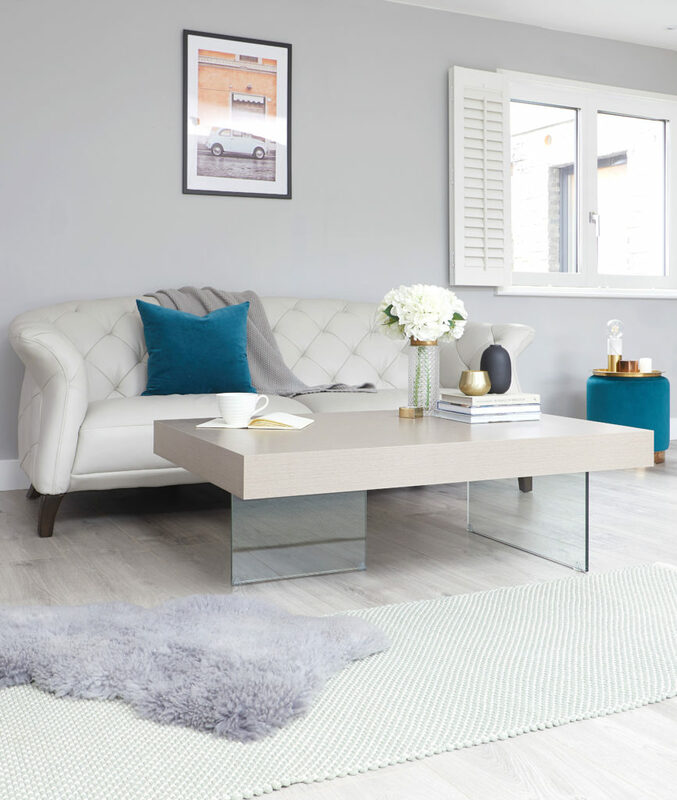 Stylist Tips: The Grey Oak laminate will feel different when paired with different colours. For a warmer look, pair with new warm neutrals and colours with a red or yellow undertone. To look cooler, choose more greys with blue undertones. 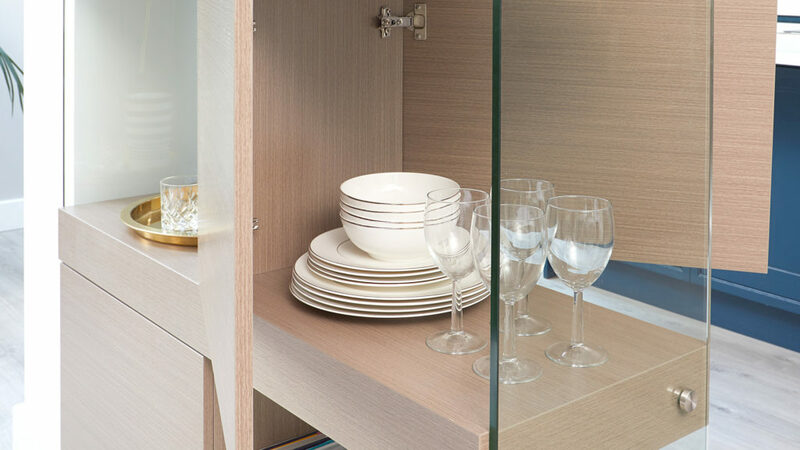 Laminate furniture isn't just perfect for dining tables, but also storage furniture too! 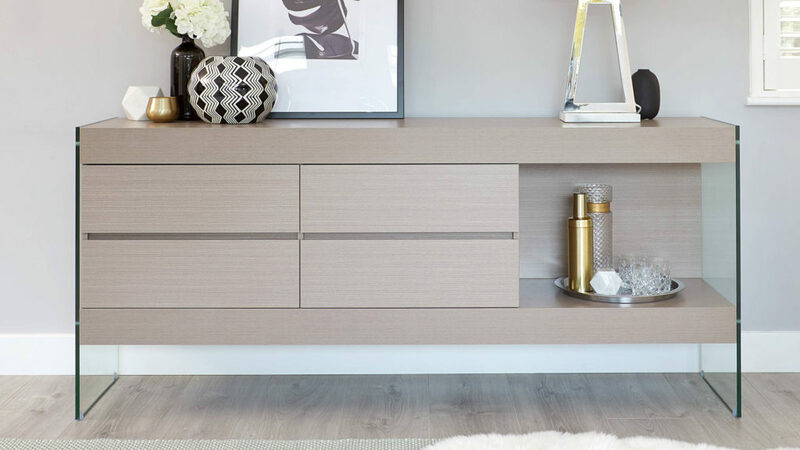 We've made it easy for you to create a well dressed and coordinated how by completing the Aria range with matching sideboards, shelving units and coffee tables too! 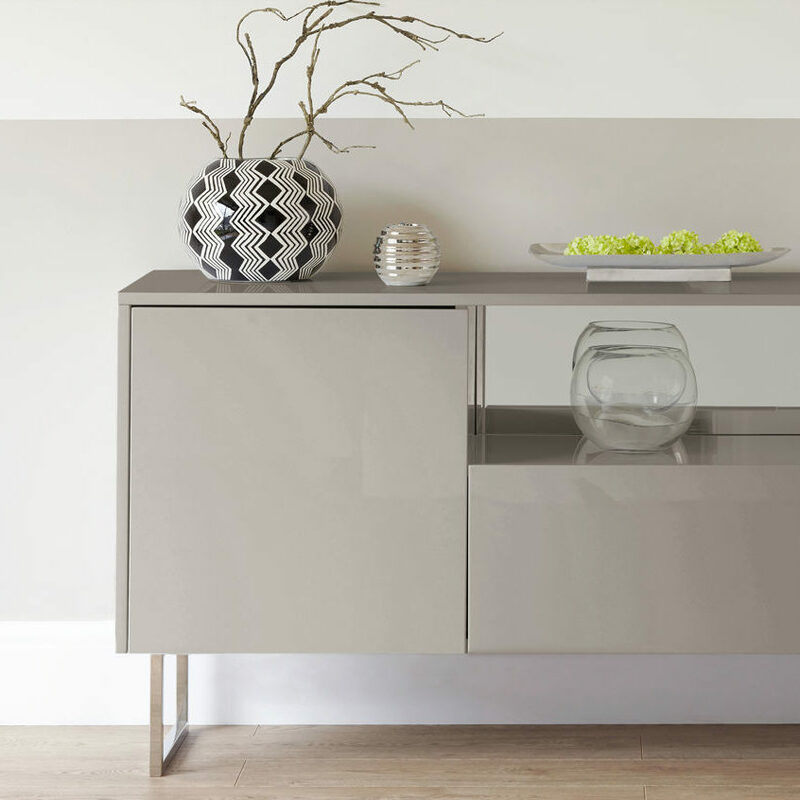 A favourite of ours in the Aria Grey Oak Sideboard. 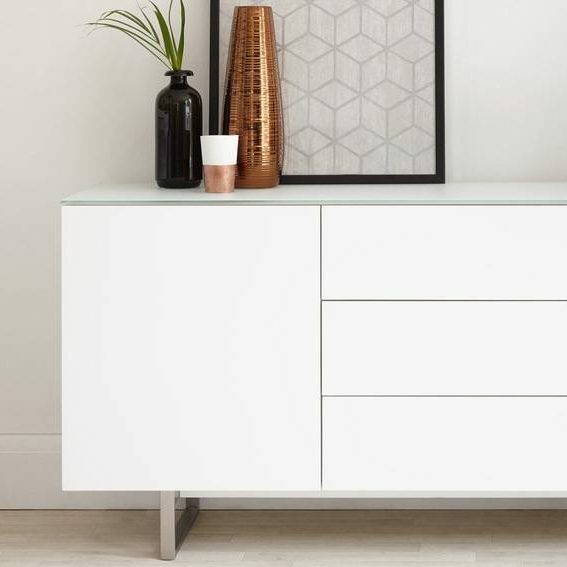 With sturdy glass sides, this modern sideboard looks light and airy in your home, while being a practical storage unit to hide away all those bits and bobs. 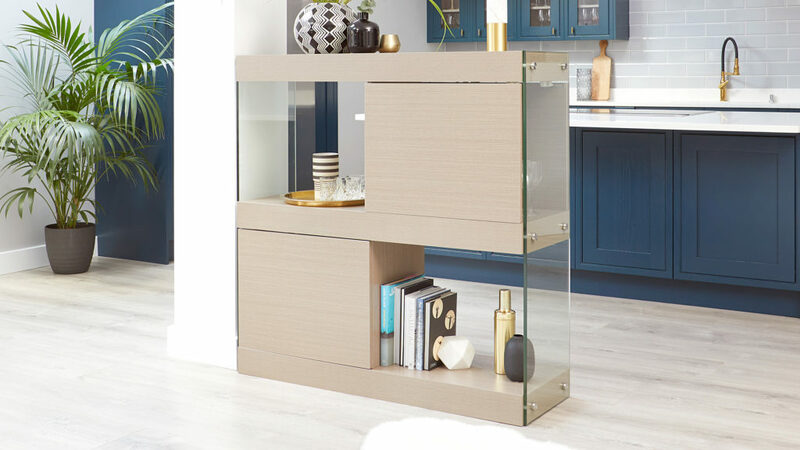 Showcase your favourite objects on the display shelf, while stylishly hiding away all those odds and sods in the handy drawers. The Grey Oak Aria Sideboard works great as a drinks cart! 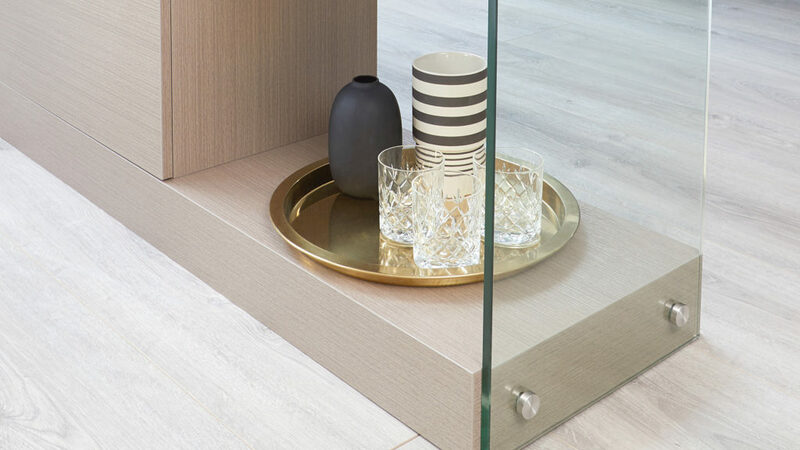 Stylist Tip: Create a sideboard/ barcart by using the display shelf to house your best glasses and Gin bottles! 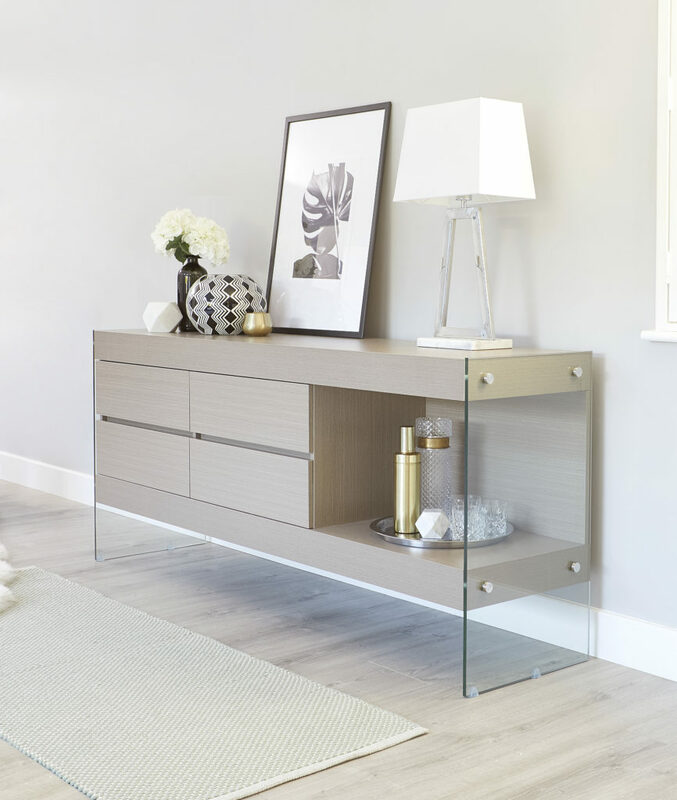 New for 2019, we have designed a super stylish and highly practical display unit as part of the Aria Grey Oak Range (but also available in white oak which can she shopped here). 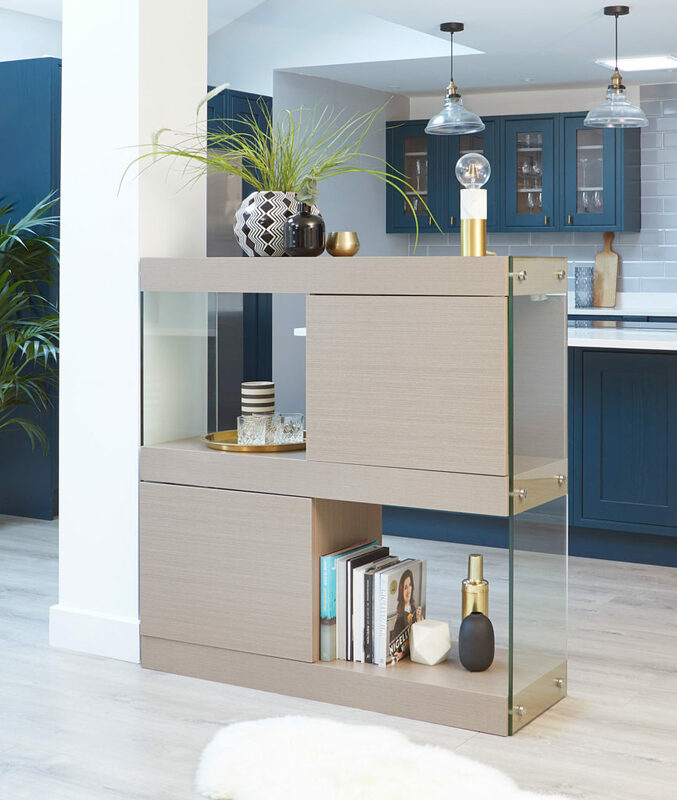 One of the best features of the Aria Display Unit is that the cupboards open on both sides, making this stylish piece of furniture 360º. Position against the wall, or use to divide your room and still have access from all angles. Handy doors on either side mean you can get to your goodies from all angles. Stylists Tip: Be aware that you can see into the cupboards even with the doors closed, so maybe avoid piling in those letters and random bits and stick to showcasing your fine china while keeping dust at bay. 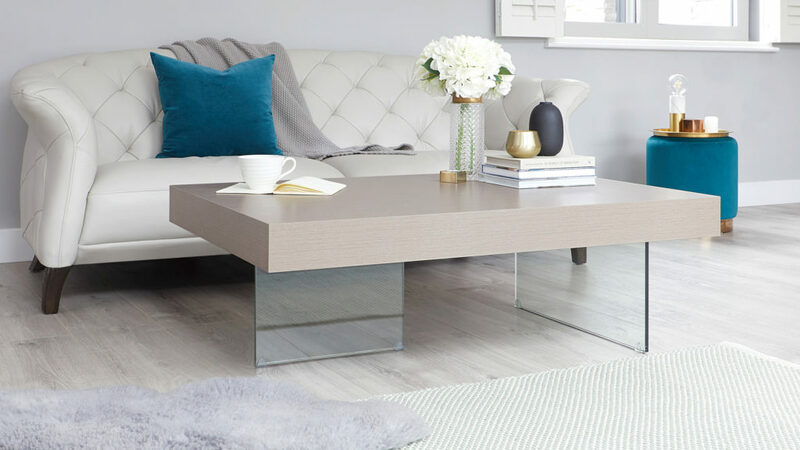 And finally, complete the look with the Aria Coffee Table. 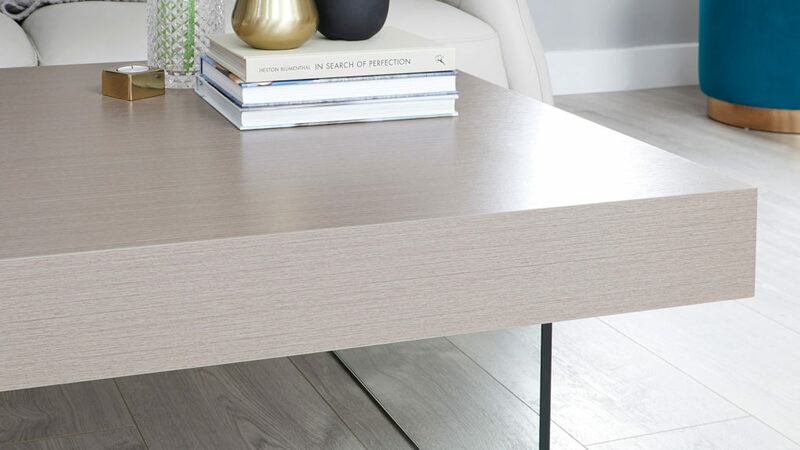 Like the rest of the range, this coffee table consists of a soft grey oak top paired with sleek and minimal glass legs. 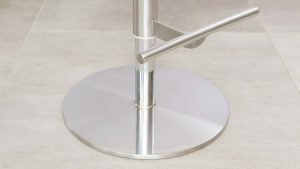 Glass legs promote a modern and stylish feel, while keeping your interior feeling open. The glass allows light to flow throughout your home and feel bright and airy all year round. 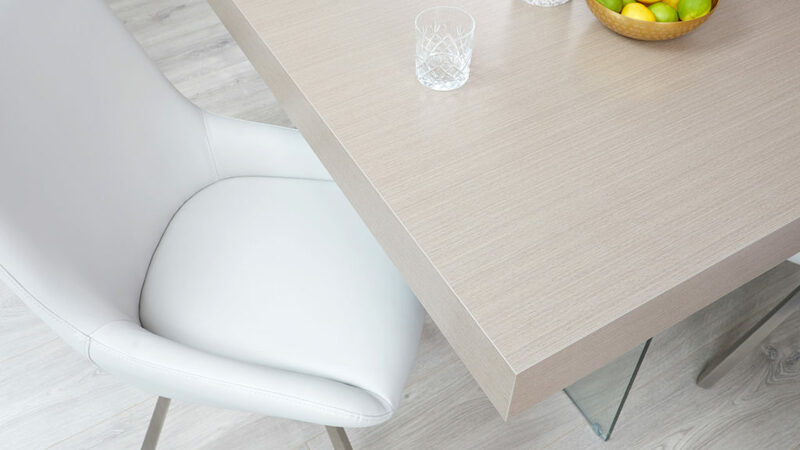 The grey oak veneer of the Aria range creates a soft sheen, keeping your interior bright and airy! 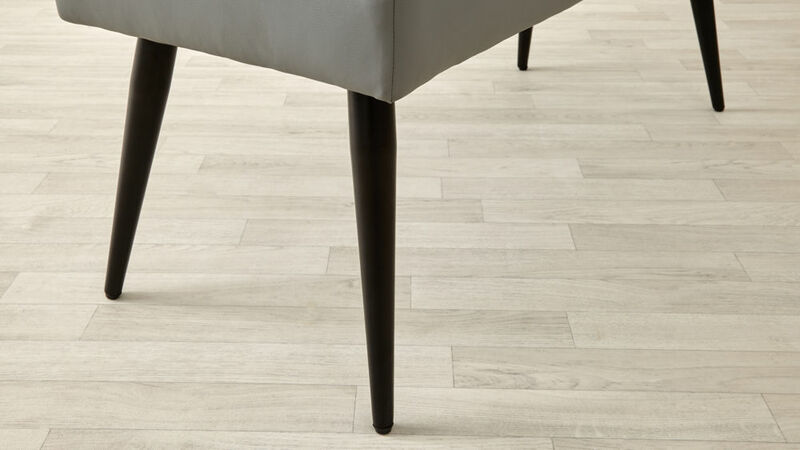 The grey oak laminate is super versatile and can be used with whatever sofa or statement chair you wish! Position in front of a real leather sofa for a soft, minimal and modern look, or pair with a rich green velvet sofa for a softer, richer look. The possibilities are endless! 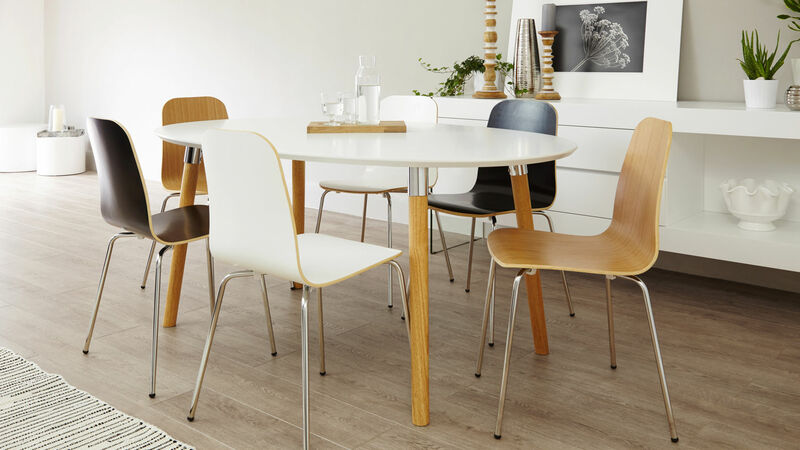 Tell us what you think of the new Aria Range, and if you have any questions on Wood Laminate, leave us a comment below. Don't forget to share your pictures with us on Facebook and Instagram by using #mydanetti! 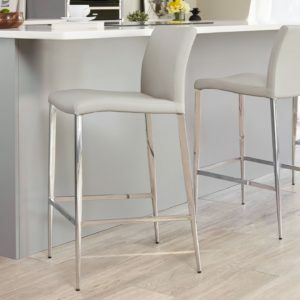 A common stumbling block when choosing a kitchen bar stool is whether to go for a backrest or a backless bar stool. 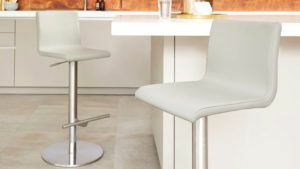 While having a kitchen counter bar stool with a backrest offers plenty of support, you might not like the idea of the bar stool's backrest being visible above the height of the countertop. 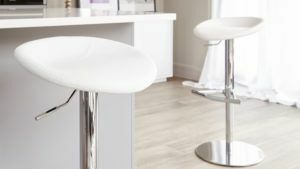 Below we've written a quick rundown of the benefits and considerations of each design to help you choose the right stool for your space. Good lumbar support. When sitting in the same place for a while your body can often slump, so with a backrest, this can take off some of the stress on the back. 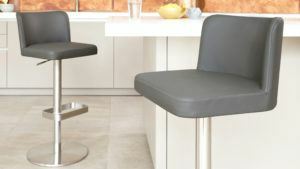 Backrest bar stools feel more secure as you have a supporting surface at the back. The backrest may be seen above the height of the countertop. Dependent on the height of the backrest will depend on how much will be visible above your kitchen countertop. This is a purely aesthetic issue but should be taken into account. 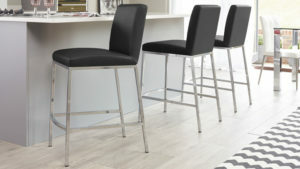 Kitchen bar stools with a backrest cannot be fully tucked under your counter or table. 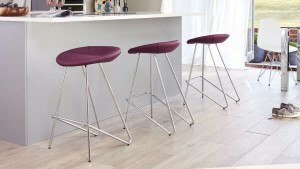 Therefore, the stools will be more visible and take up slightly more floor space. 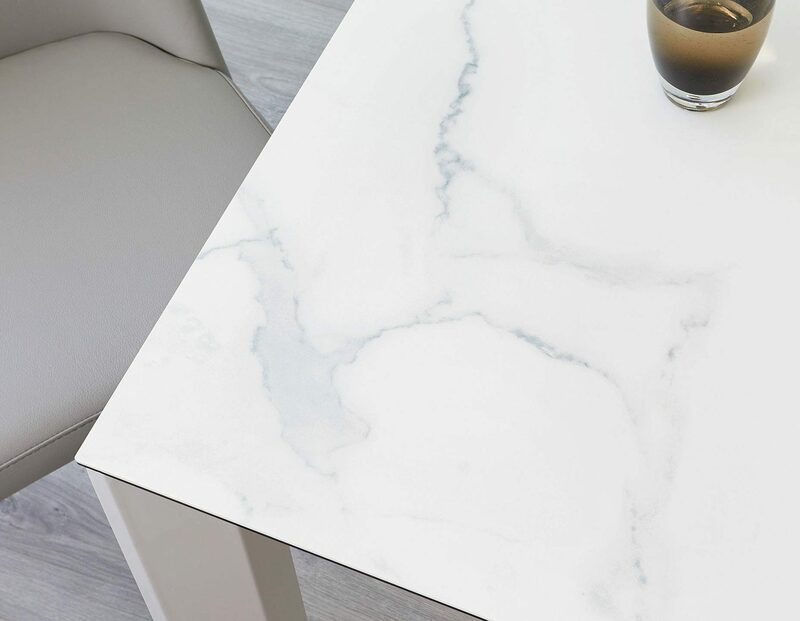 No visible backrest above the height of the countertop so you have nothing to break up the simple straight lines of the surface. 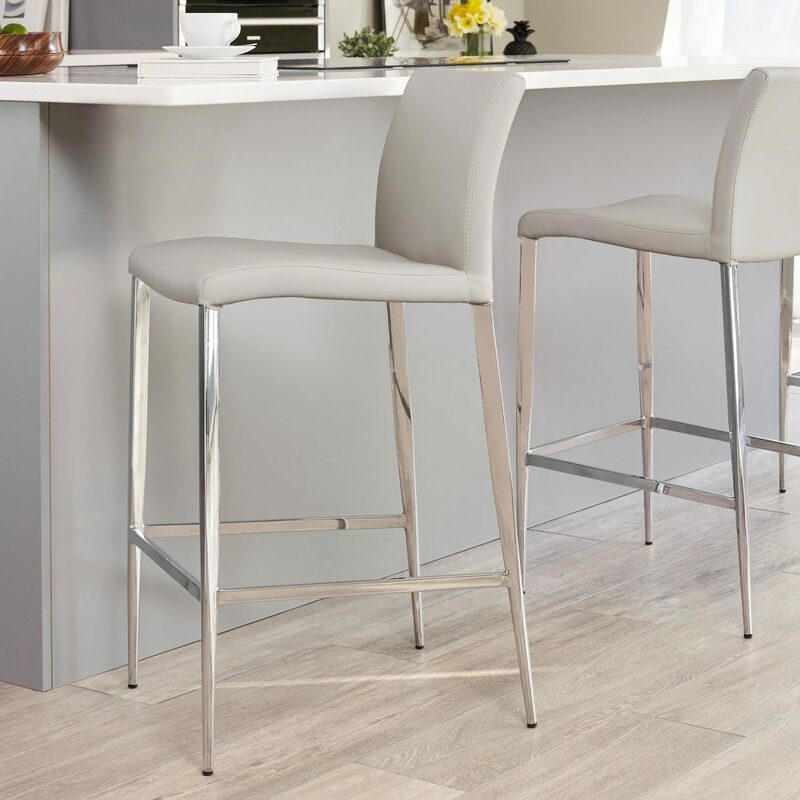 Backless kitchen bar stools can be tucked under the counter or table so they'll take up less floor space. This is ideal if you're a little pushed for room. As there is no back support, when seated you'll more likely to be leaning and resting on the surface in front of you. 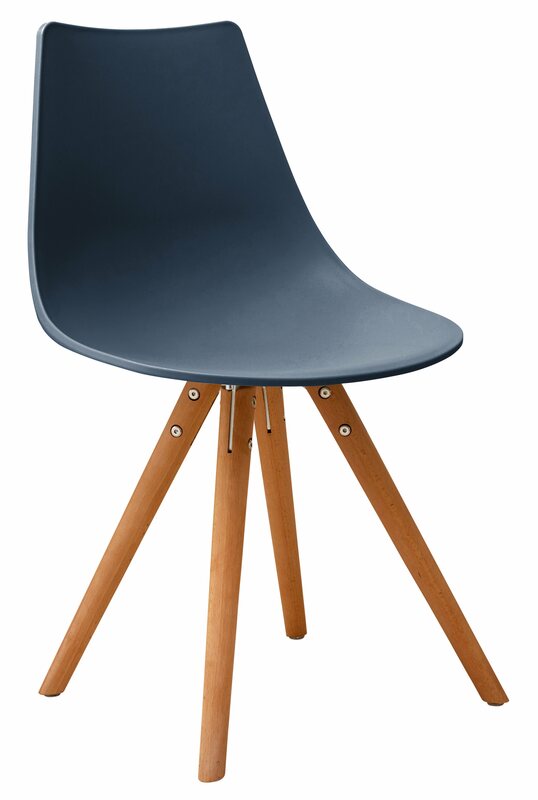 If you have younger children, backless stools offer less support when they are seated. 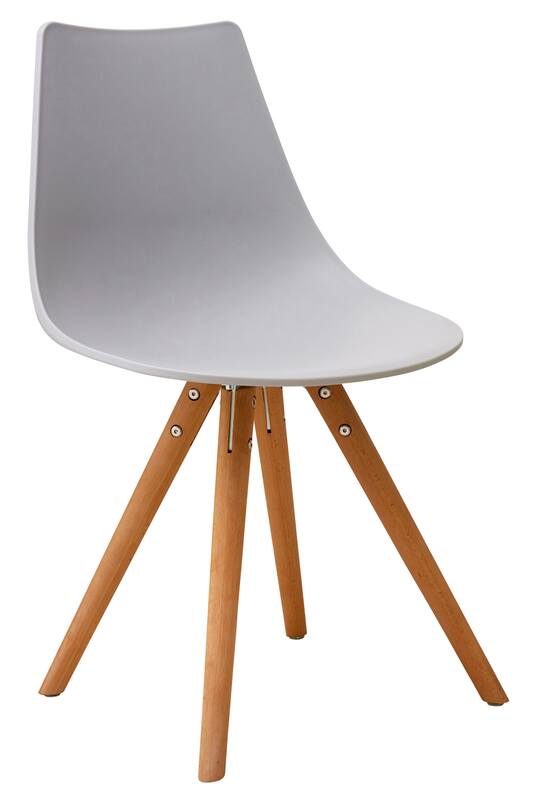 This style of stool offers some Lumbar support for the lower spine and for the lower back. A small backrest is not so visible above the height of the countertop. 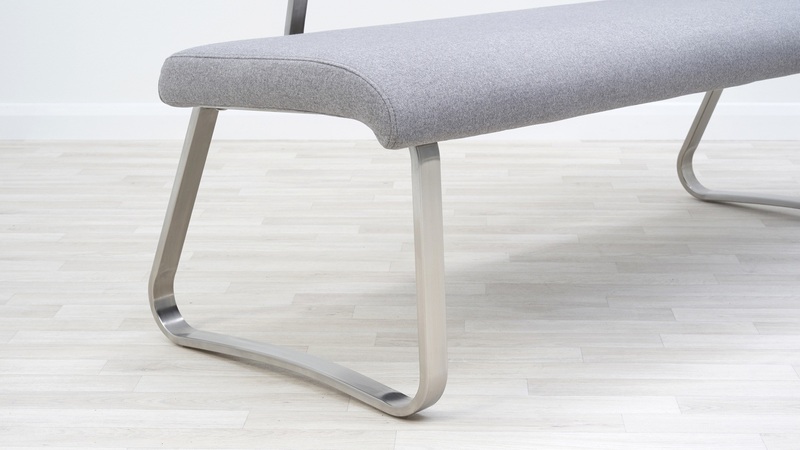 As the backrest is far smaller, it will not offer complete support for your back. 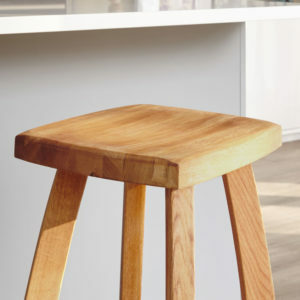 Like a backless stool, a stool with a small backrest won't offer full support for younger children. 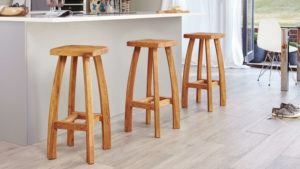 We hope we've given you some inspiration as to what stool will be right for your space. Now let's choose the perfect seat! 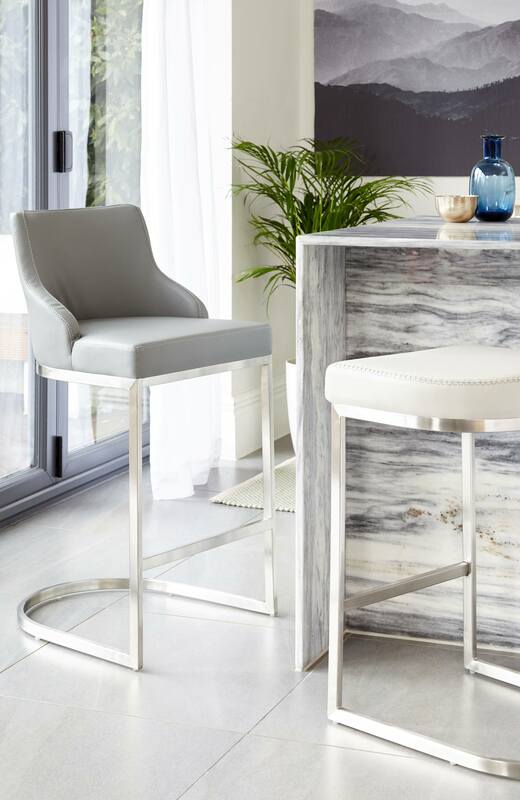 Head over to our website to full the full range of backless and backrest bar stools. 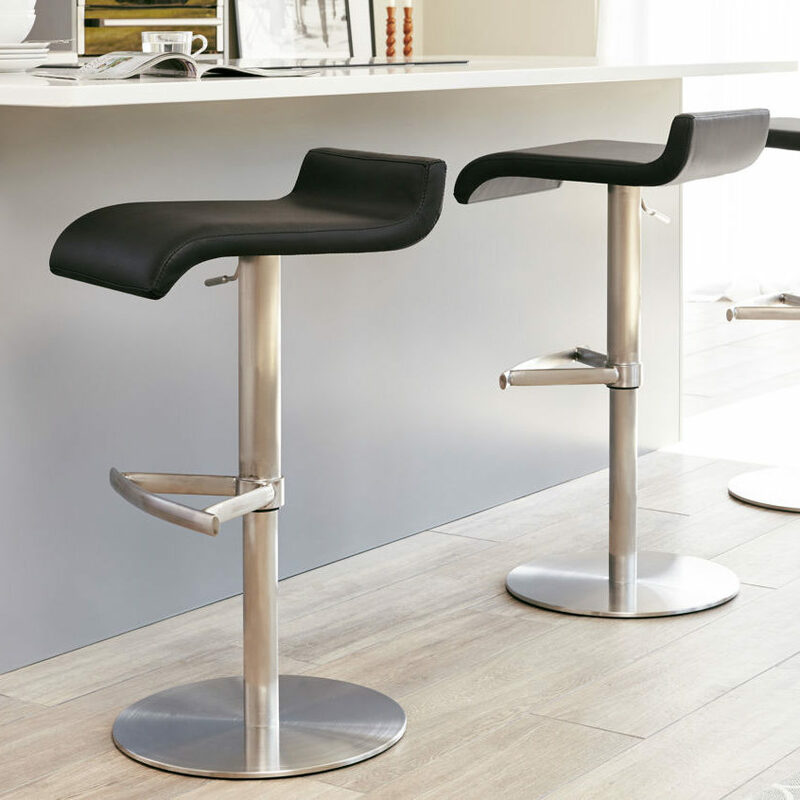 For more sizing and styling tricks, be sure to take a look at our Bar Stool Buying Guide. The modern family kitchen consists of 3 key elements: an open space, a cosy feeling and quality furniture. Open space comes with the design of the architecture. 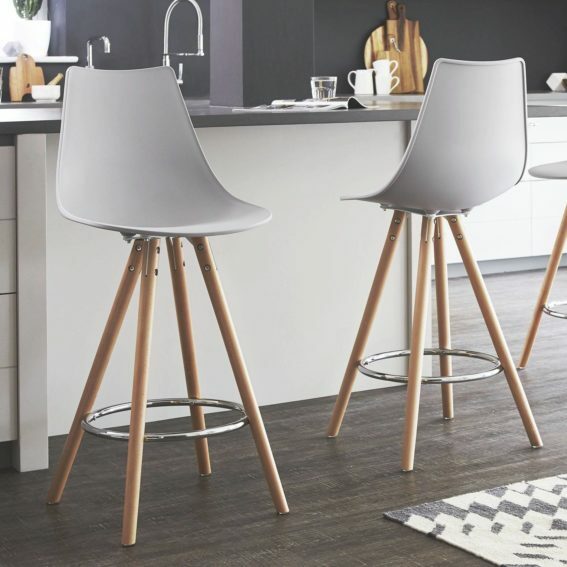 A cosy feeling comes from you and your family spending time together, but the quality furniture, that's where we come in... Say 'Hello' to Kiki and Arlo, our new Real Leather Bar Stools. 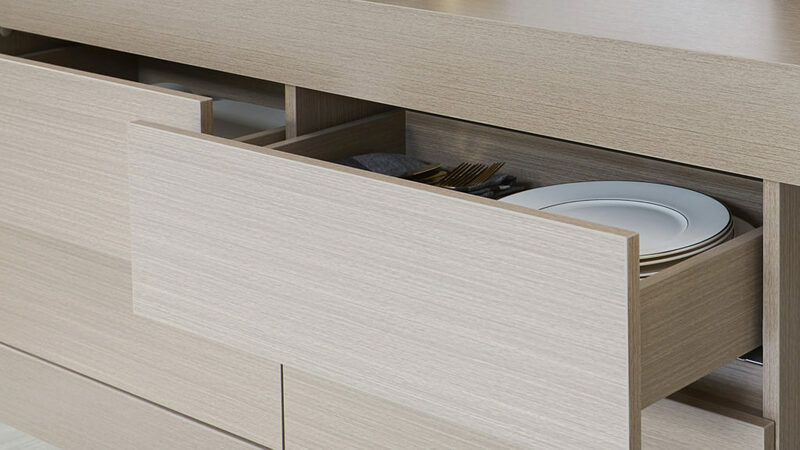 Creating a modern family kitchen can be very simply achieved by the addition of luxury materials, such as real leather. 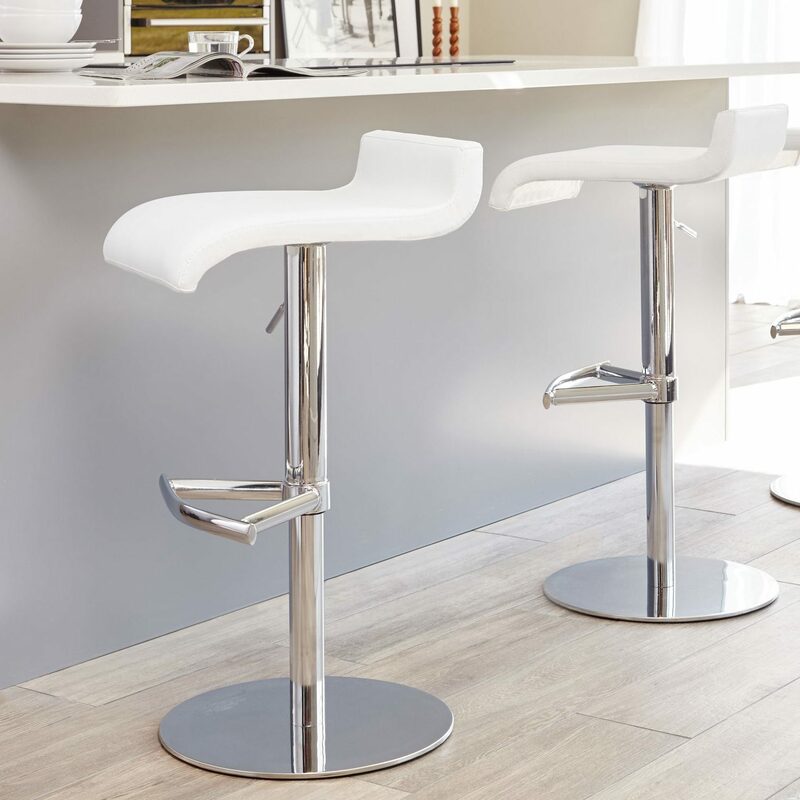 Our new Kiki and Arlo real lather gas lift bar stools have a Stainless Steel base to bring an extra element of modern design. Keep on reading to see our new products, and a few must-know tips when it comes to care and styling. Firstly, take a look at Kiki. 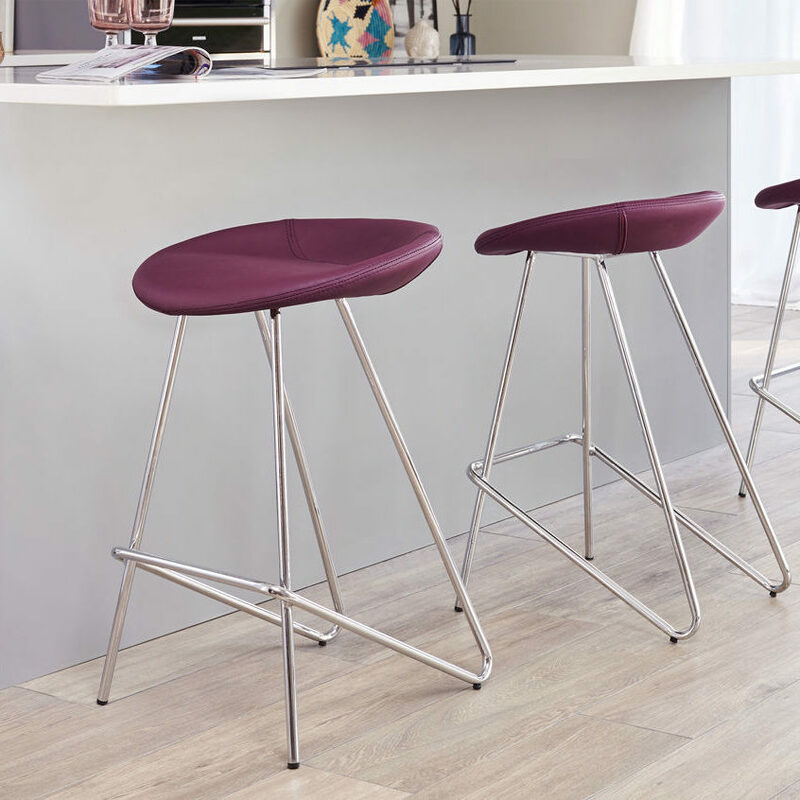 With a sleek silhouette, the Kiki real leather bar stools are made for modern, minimal interiors. 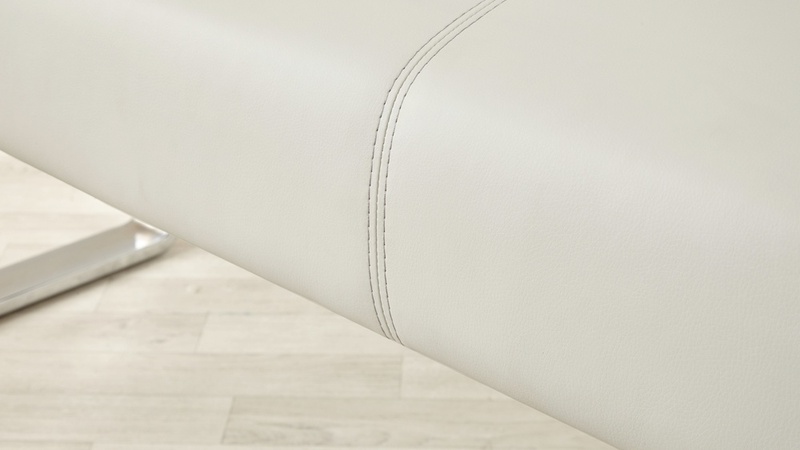 With a considered, simple footrest and flat penny base, the details bring a touch of elegance as much as the real leather seat. 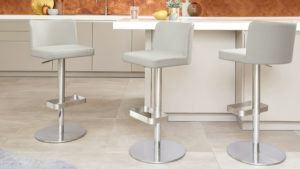 The Kiki real leather bar stools come in Cool Grey or Putty grey to suit many interior styles. 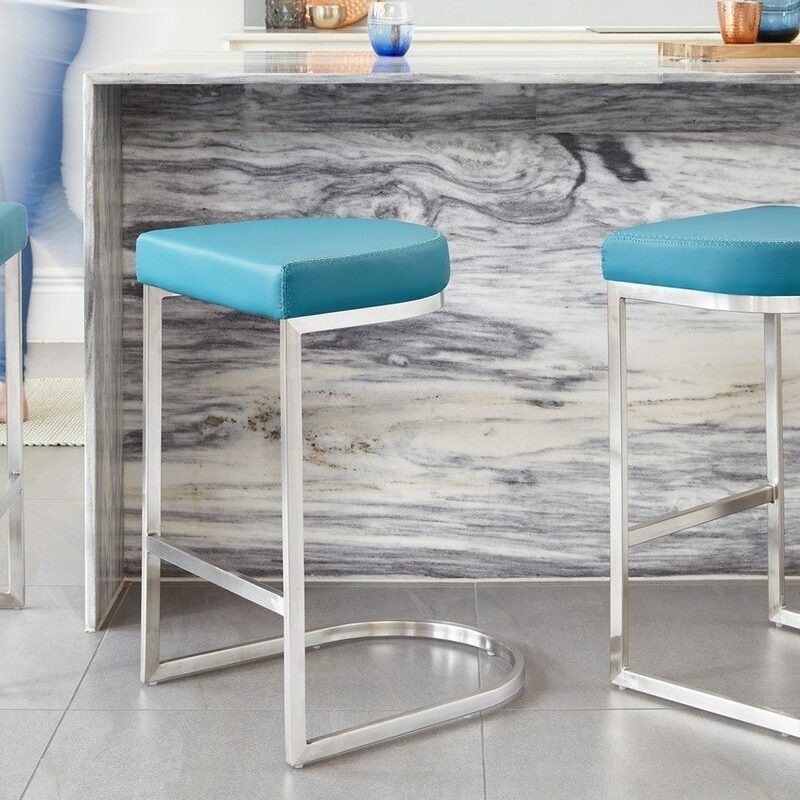 These bar stools are simple, so keep styling reflective of this. Clean silhouettes and simple shapes will really bring this look to life. 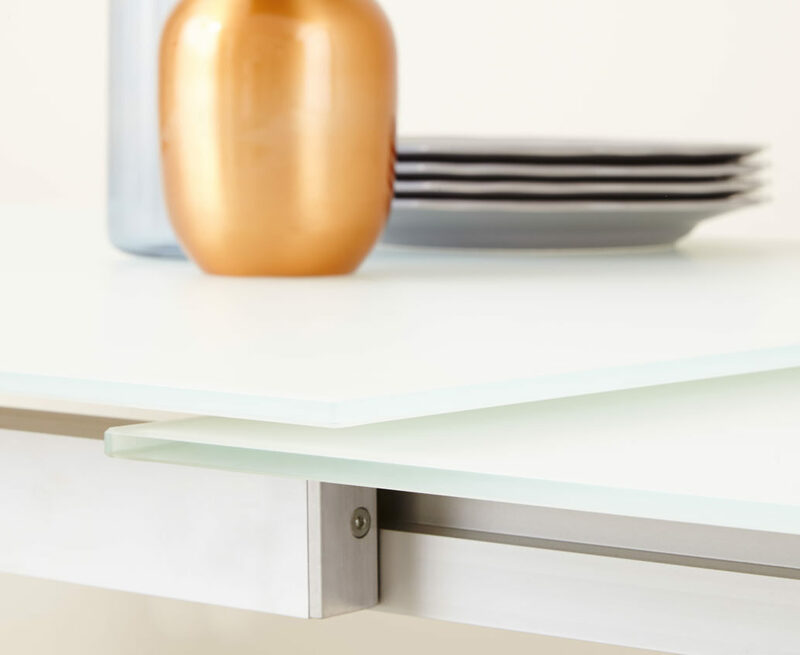 Pair stainless steel finishes with high shine brass and textured copper for a warm, modern look. Contrast the cold metal base with soft, inviting textures and rich colours for a balanced style. A gentle wipe with a damp, soapy cloth is more than enough to clean both the real leather and stainless steel base. 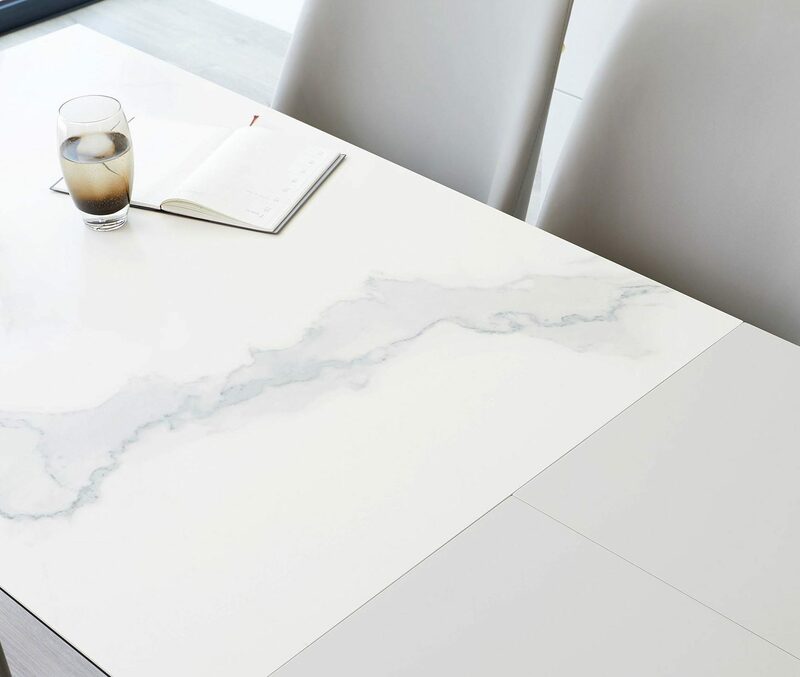 Ensure not to leave spills sitting on the surface, as this can cause staining. Never rub, always dab your leather to protect the surface. Always use a leather protector on new, clean stools. This will add an extra level of protection against any spills. Keep real leather conditioned with a balm or cream. Once or twice a year, give your real leather bar stools a clean and condition to keep the leather subtle and looking newer for longer. 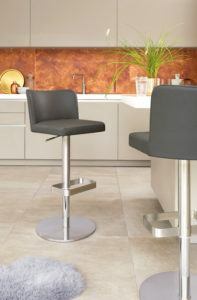 Arlo is a much more sumptuous and luxurious real leather bar stool. Unlike Kiki, Arlo has a thicker seat and curved backrest, allowing for higher comfort levels and longer meal times with your family. The seat and backrest are not one piece, rather two separate sections giving a fuller seat shape. The Arlo also has a more structured footrest for added comfort. 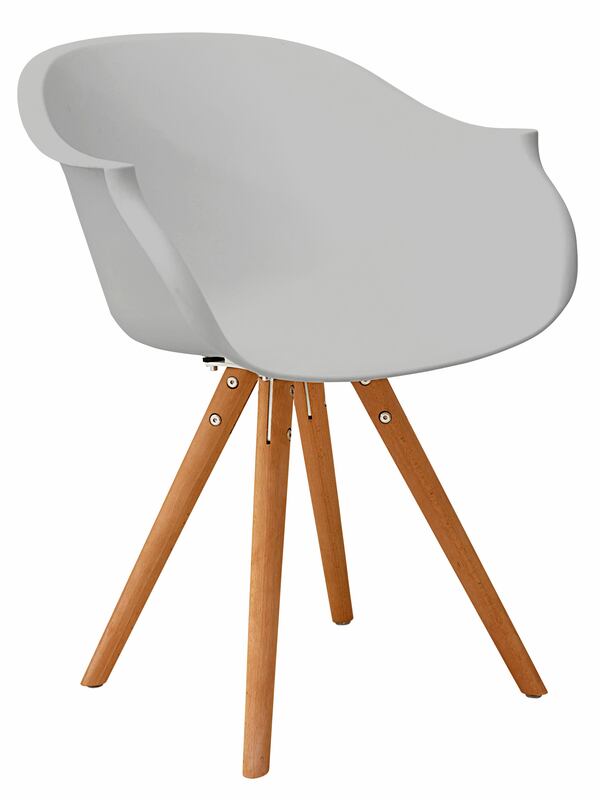 Where Arlo is a more luxurious stool, play around with luxe textures when it comes to styling. Choose bold colours and textures for a maximalist look. 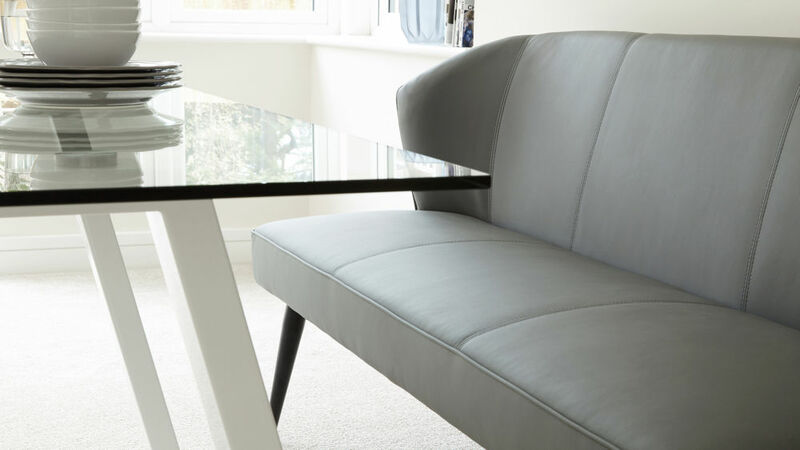 Add curved, sumptuous shapes to mimic the silhouette of the Arlo seat. Keep your base colour palette simple, with added pops of metallics and colours for a luxe vibe. 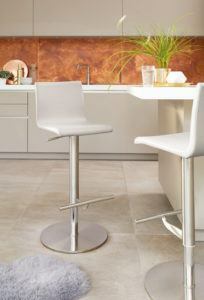 Why Choose Real Leather Bar Stools? Leather is a naturally hard wearing material, making it perfect for busy family life. Unlike faux leather, real leather is much thicker, so will not rip or peel and, if properly cared for, will last for years to come. 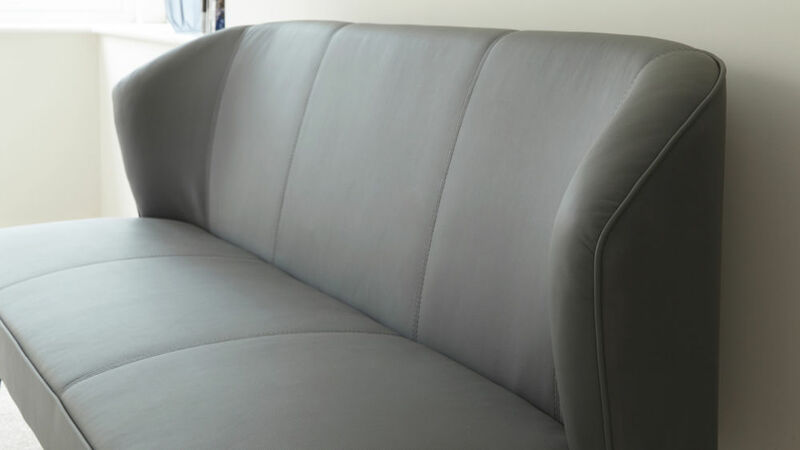 Real leather furniture can be more expensive than faux leather. However, it's important to remember you're buying a product to last. 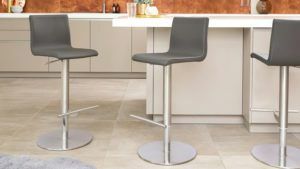 Faux leather is more cost-effective for quickly changing trends, whereas real leather bar stools are an investment and usually a classic design which won't date. For more insider secrets on caring for your leather furniture take a look here. 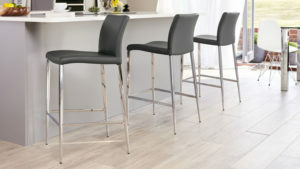 So tell us, which real leather bar stools would you choose? Kiki? Or Arlo? Let us know and remember to share your pictures with us on Facebook and Instagram by using #mydanetti. Dining Room Ideas: How to Get The Look in Your Home! If you think about it, your kitchen and dining room is far more than just a place to cook, sit and eat. They are the social hub of our homes, becoming the go-to place for social gatherings, entertaining guests and sitting with the family day to day. 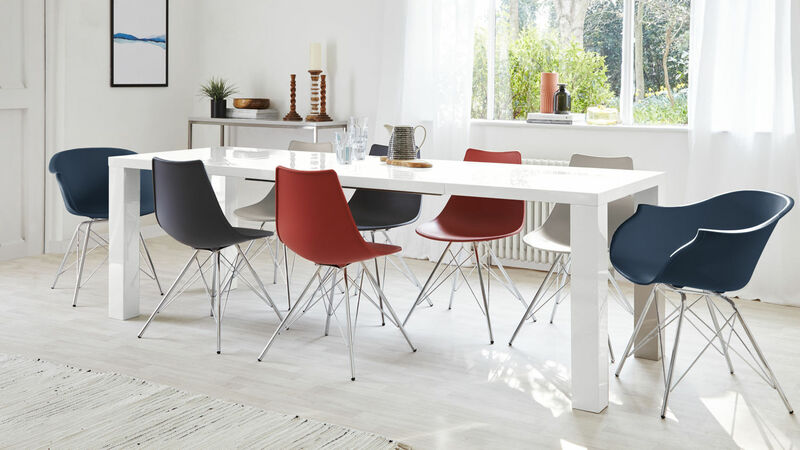 We truly believe that with the right furniture, you can transform your dining room into the heart of your home. 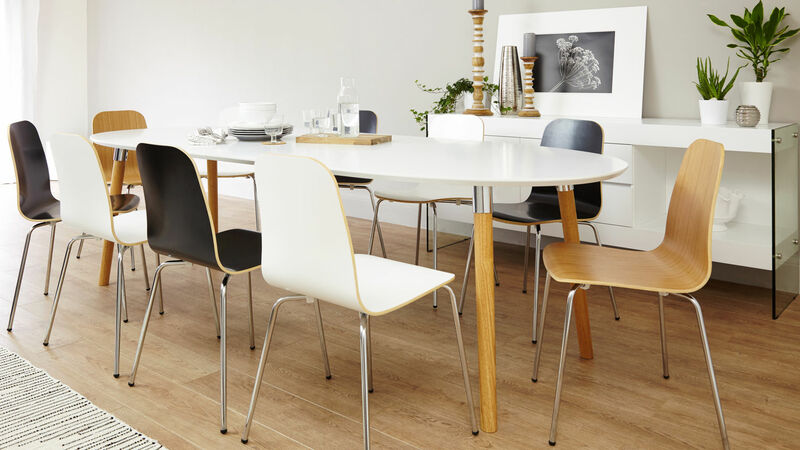 So, whether you’re renovating your dining area or would like some tips on how to create effortlessly modern looks, we wanted to inspire you with some of our top dining room ideas. 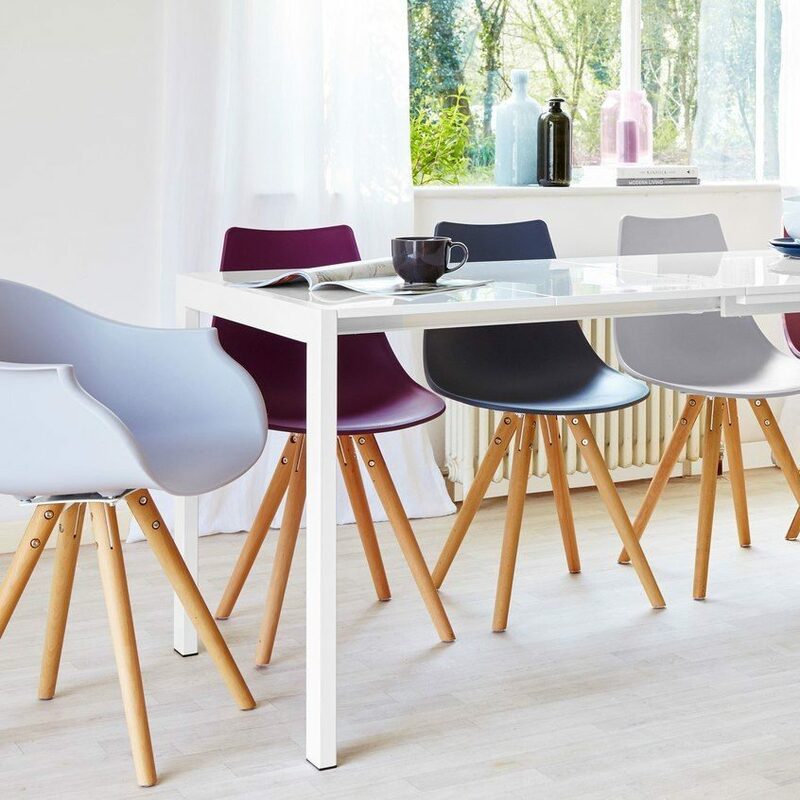 In this post, we’ll give you tips on what pieces to choose to create a certain look, along with stylish alternatives to suit your dining room and budget. We'll also show you how to coordinate each look with other pieces in your home for a truly stylish setting. 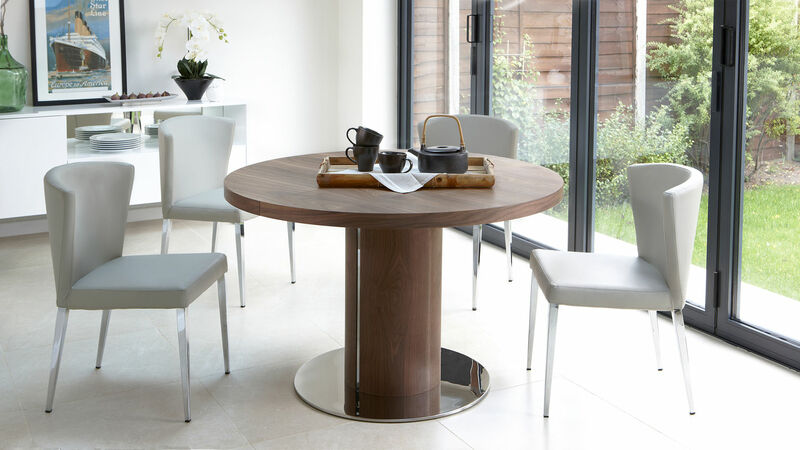 Combining a rich walnut table finish with real leather dining chairs will instantly add a cosy yet premium feel to your dining area. This is because wooden finishes have such a tactile and inviting look, while real leather is known for its material quality and longevity. With a table like the Assi, you’ll also able to extend your seating options, making everyone feel welcome on those cold winter evenings. 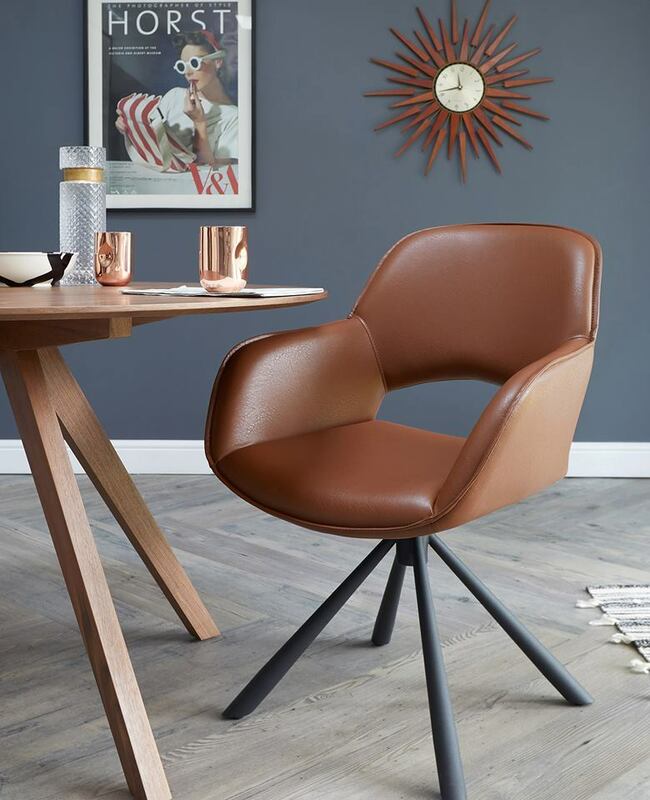 If you’re working to a budget or don’t feel you’d benefit from having real leather dining chairs, the faux leather Moda Dining Chair also looks great styled alongside the Assi. The slightly angled brushed metal legs mirror that of the table legs, while the quilted faux leather seat creates an incredibly cosy and inviting look. 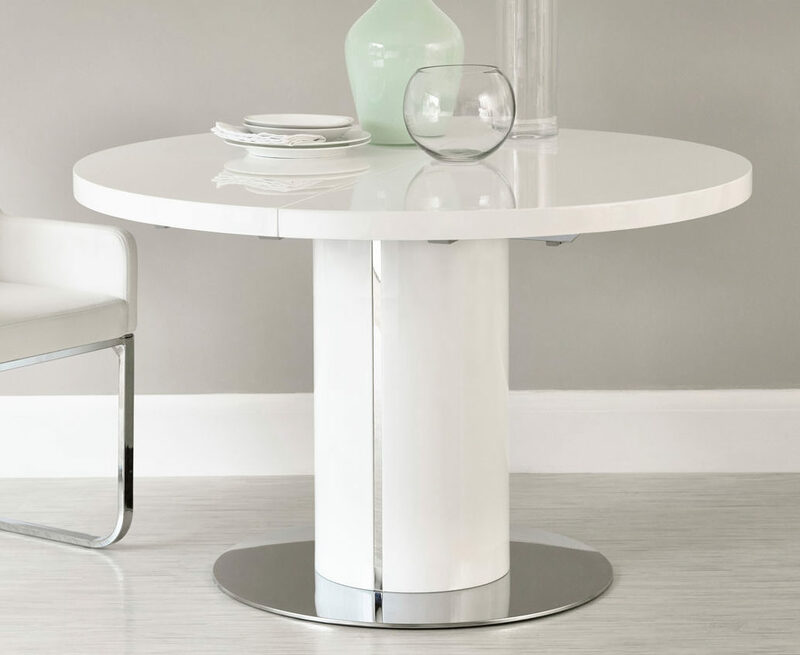 To coordinate this stylish set with rest of your space, opt for pieces with a brushed metal finish. The legs of the Deco, Moda and Assi are all finished in brushed metal, so this will really help to tie the whole scene together. If you have a breakfast bar, the Fondi Gas Lift Bar Stools in Brushed Steel would work and treat, while the Assi Compact White Gloss Sideboard will lighten the look and provide storage space for any cutlery, cups and dinner plates. Sometimes, less really is more. 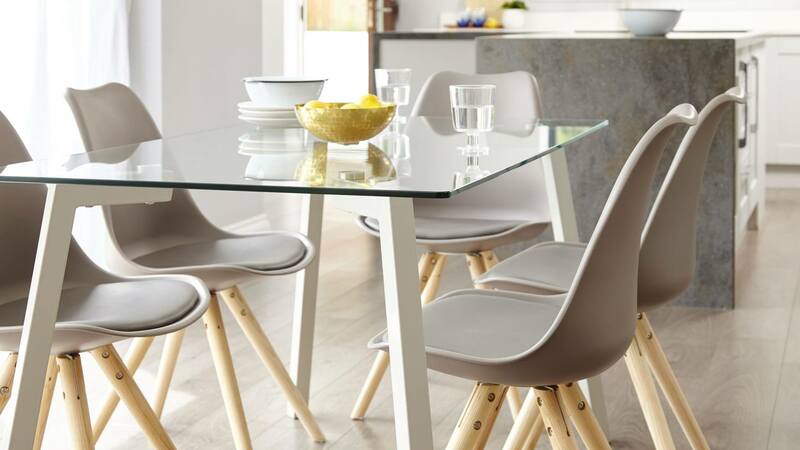 Keep this in mind if you’re hoping to create a really modern yet simple dining interior. 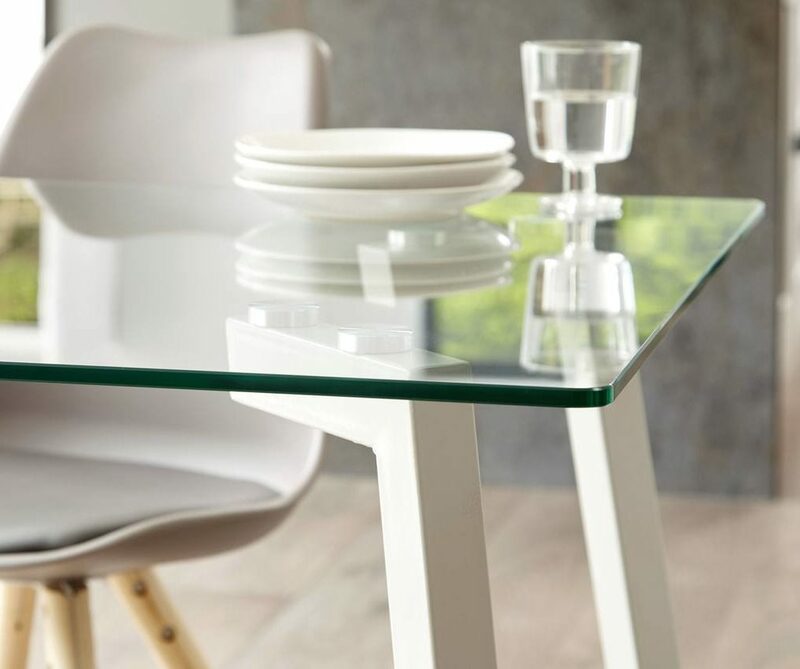 Glass is a great option for more neutral styling as it’ll keep your dining room looking crisp and bright, without creating too much visual impact. 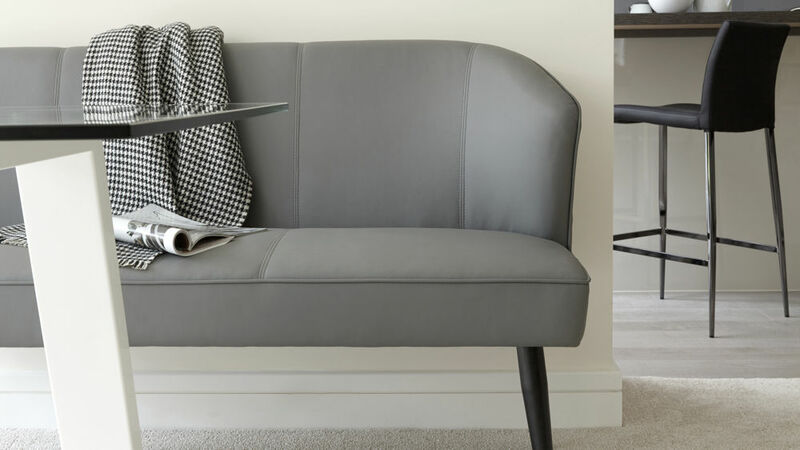 Paired with chairs like the Stylo in cool grey, the look is clean and contemporary without being too busy or over complicated. 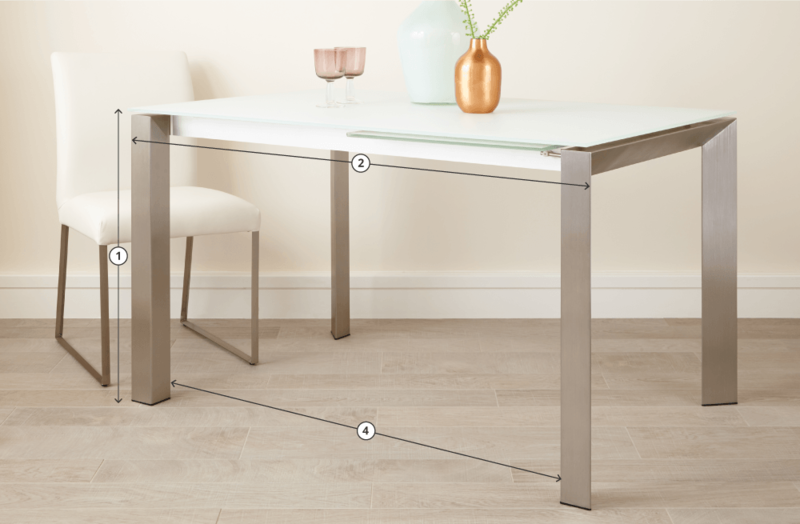 The simplicity of glass tables like the Profile means that you can create a variety of different settings depending on the chairs you choose. 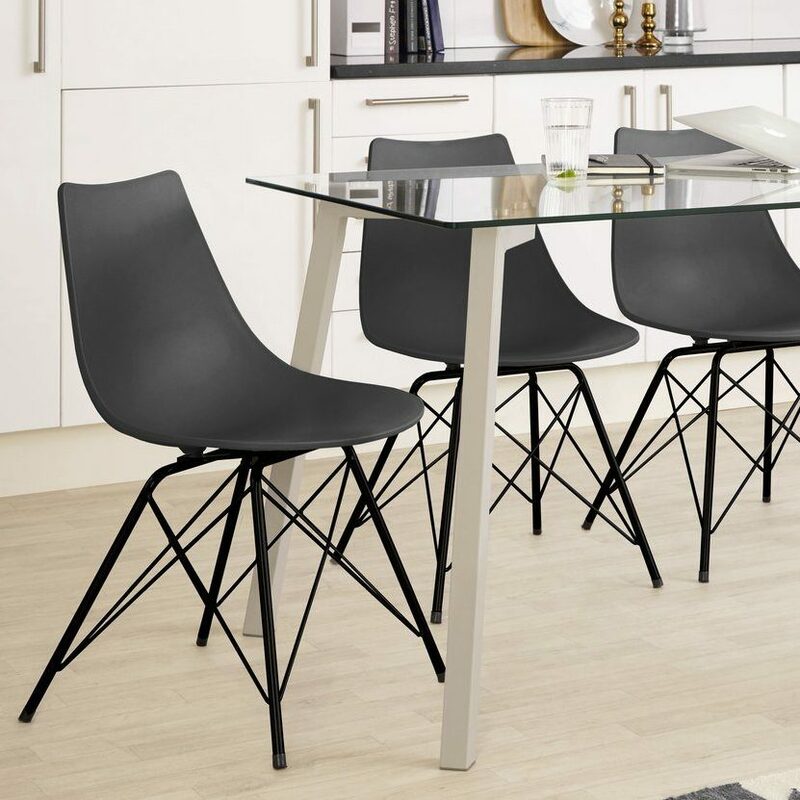 For example, you can create a strong and impactful look with a piece like the Delta dining chair, due to its matt black leg frame. 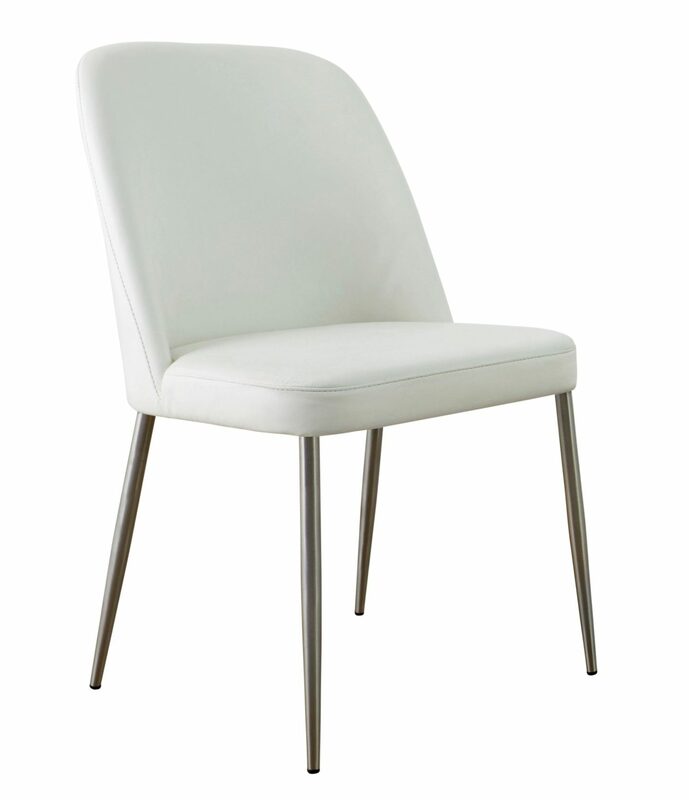 Alternatively, you could opt for a chair like the Ida which creates a softer look. 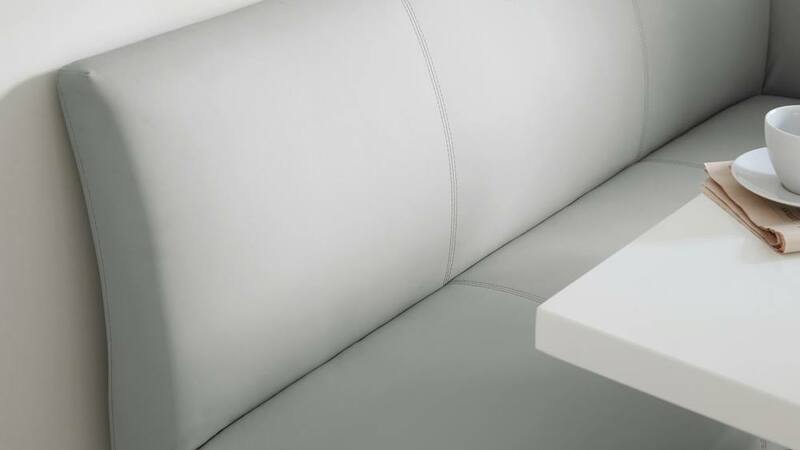 The Ida adds a touch of warmth to the crisp lines of the Profile with its beech legs and smooth PU padded seat. 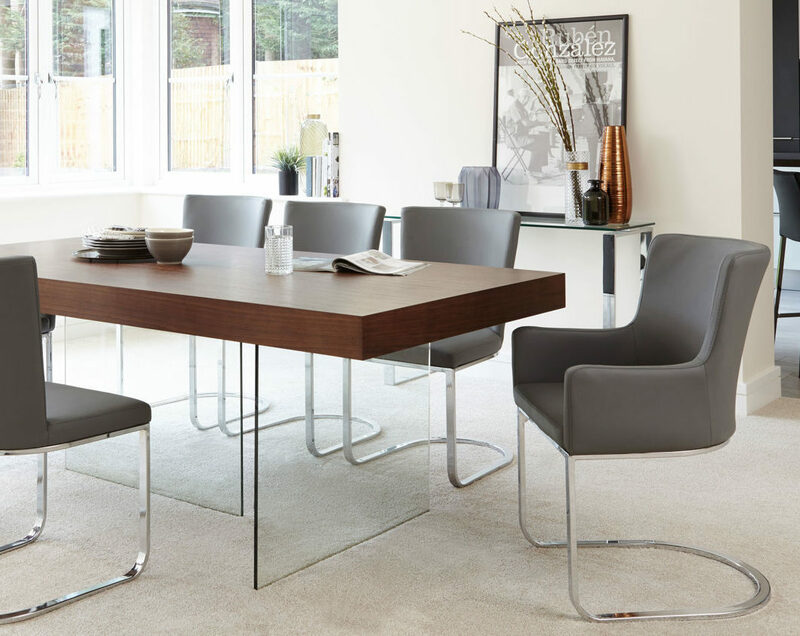 To carry a really fresh and contemporary vibe throughout your dining area, coordinating grey gloss and glass finishes are ideal. If you’d like to break up the look and introduce a hint of colour, this can be done either through your choice of chairs or bar stools, like with the Anzio Modern Bar Stool in Mulberry purple. 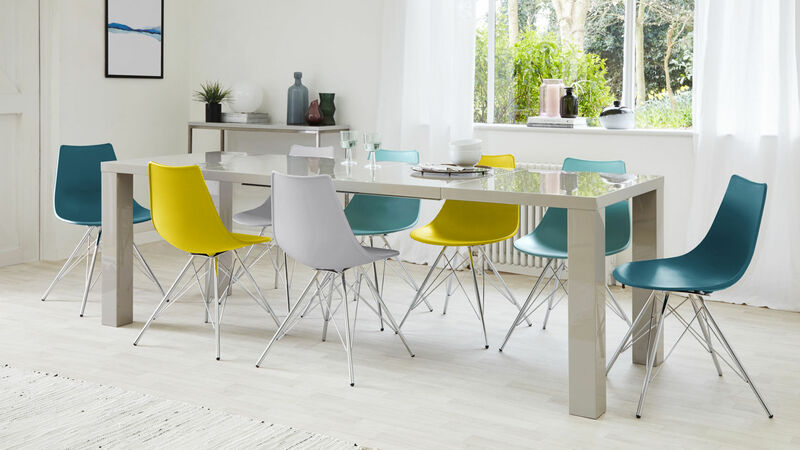 Introducing colour to your dining area doesn’t mean you have to paint your walls or revamp your cabinets. 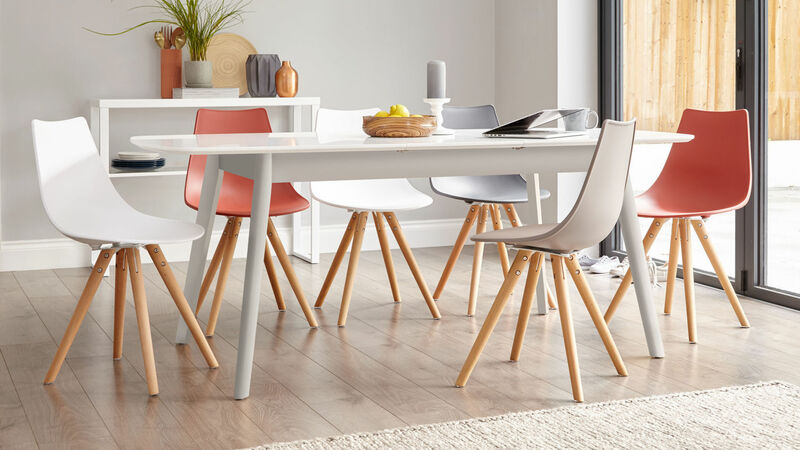 Choosing a table that’s finished in glossy neutrals like white and grey means you can get really creative with your chair colour combos. 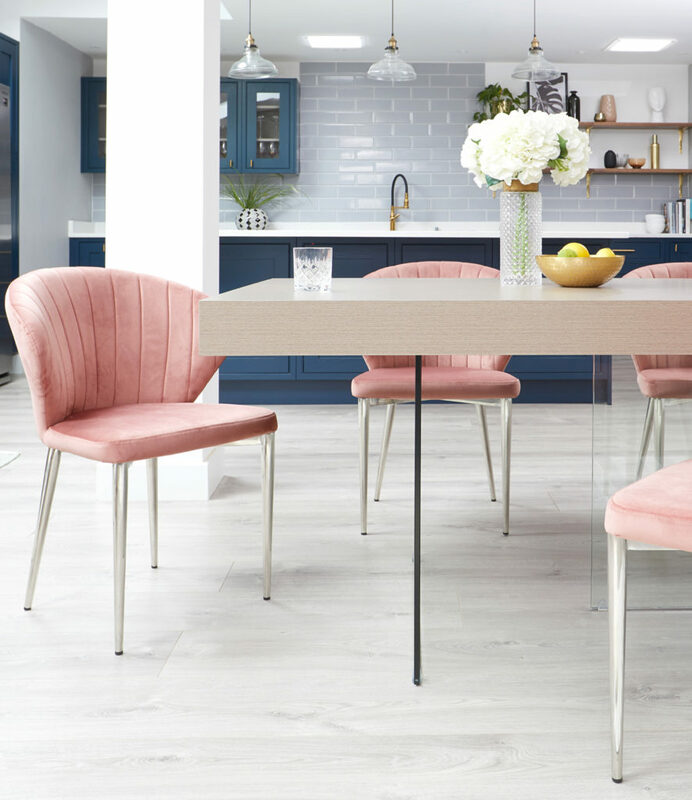 Here we’ve styled the Metro White Gloss extending table alongside a coordinated but colourful selection of the Finn dining chairs and dining armchairs for a fun, bold and designer look. 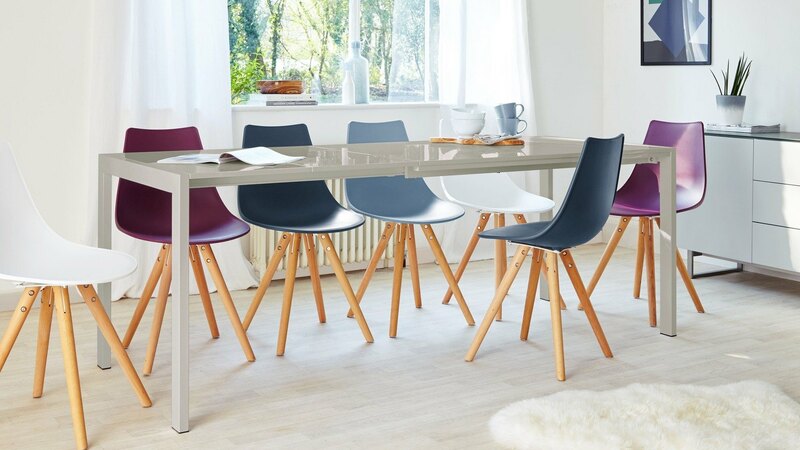 Finn Dining Chairs in Mulberry, Navy Blue, Cool Grey and Dining Armchair also in Cool Grey. 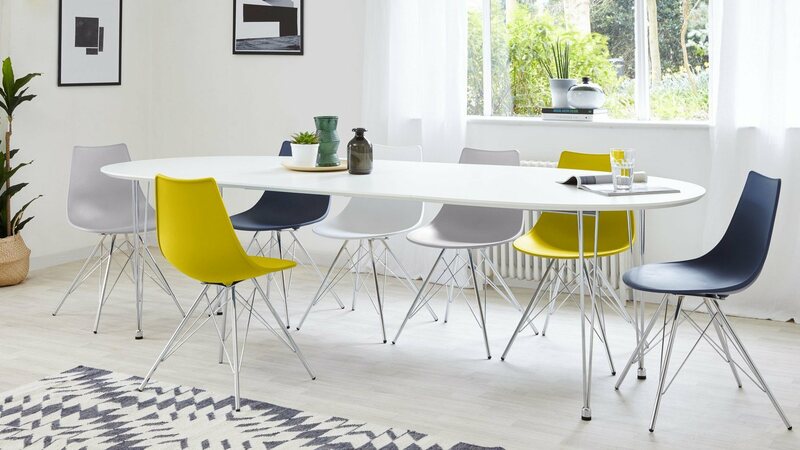 Alternatively, if bold colours aren’t your thing, swap the Finn dining chairs for something like the Tori. 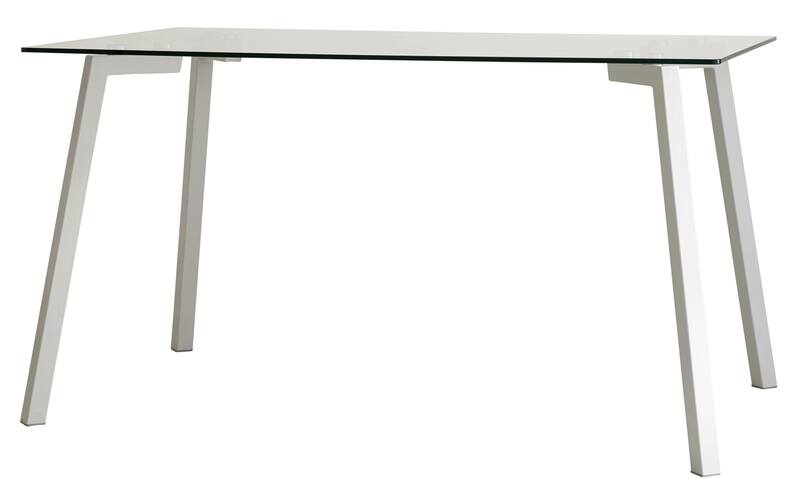 Their slim design and angular chrome legs mirror the shape of the Metro table. This helps to tie the look of the whole set together. 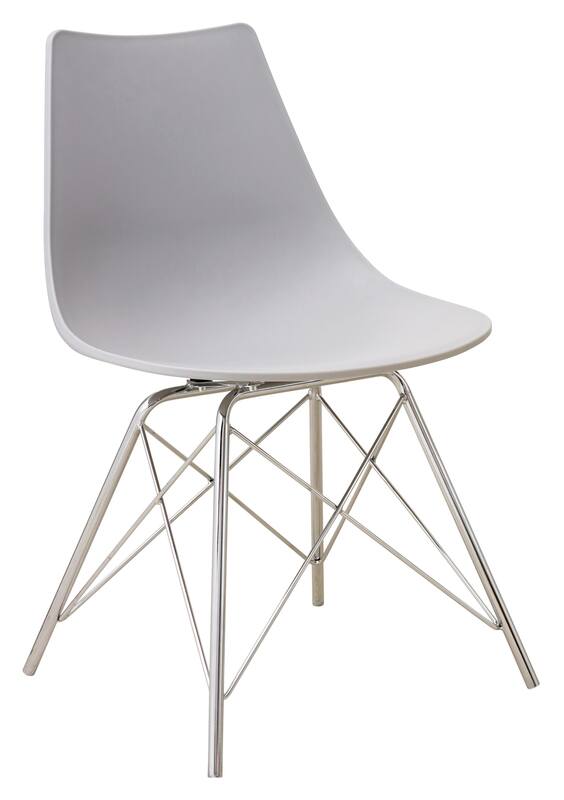 What’s more, if you’re a little short on space the Tori chairs are a stackable seat. This means you can extend the table and then stack and store the chairs when they’re not in use. 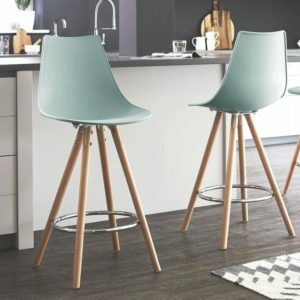 The Finn bar stools are a great way to carry a colourful look through to your kitchen and around your breakfast bar. 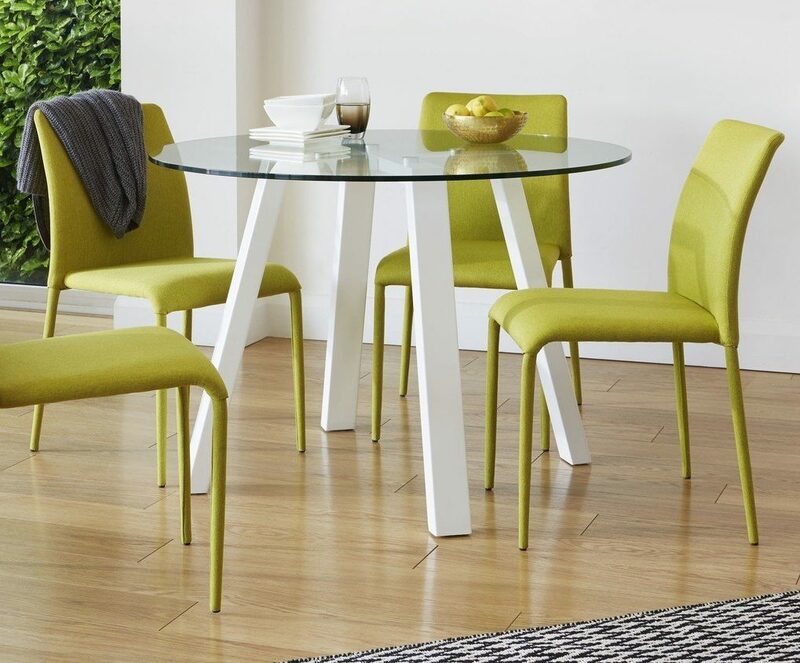 Available in the same colours as the Finn chairs, you’ll have no trouble creating a seamlessly coordinated setting. 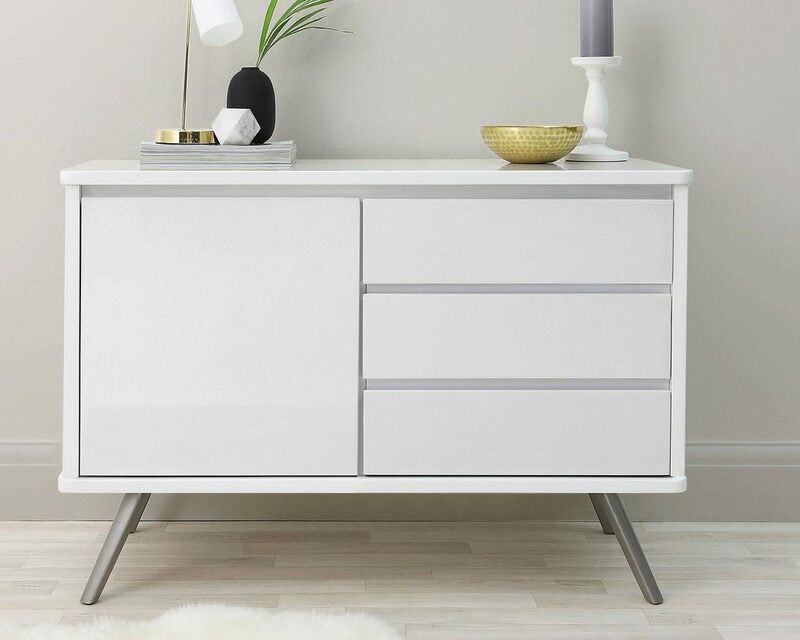 If you’re looking for storage, a piece like the Eve Sideboard will keep your dining room looking bright and fresh. 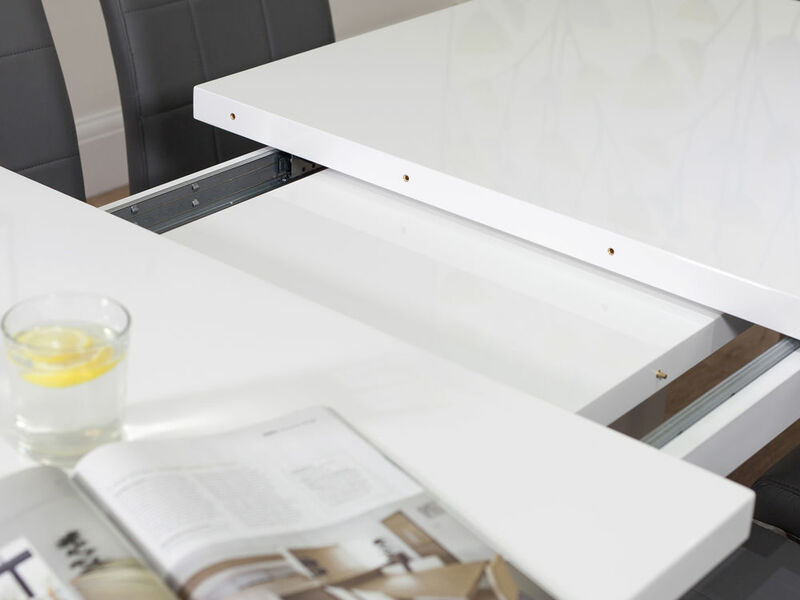 Also, having a matt finish and frosted glass top is a subtle contrast to the gloss dining table. So, which look is your favourite: the winter warmer, the modern neutral or a colour combination? Will you stick to our suggestions or create your own version of these on-trend looks? Let us know in the comments! Already have one of these stylish looks in your home? We’d love to see! Post a picture on Facebook or Instagram with the #mydanetti to have your home featured on our page. 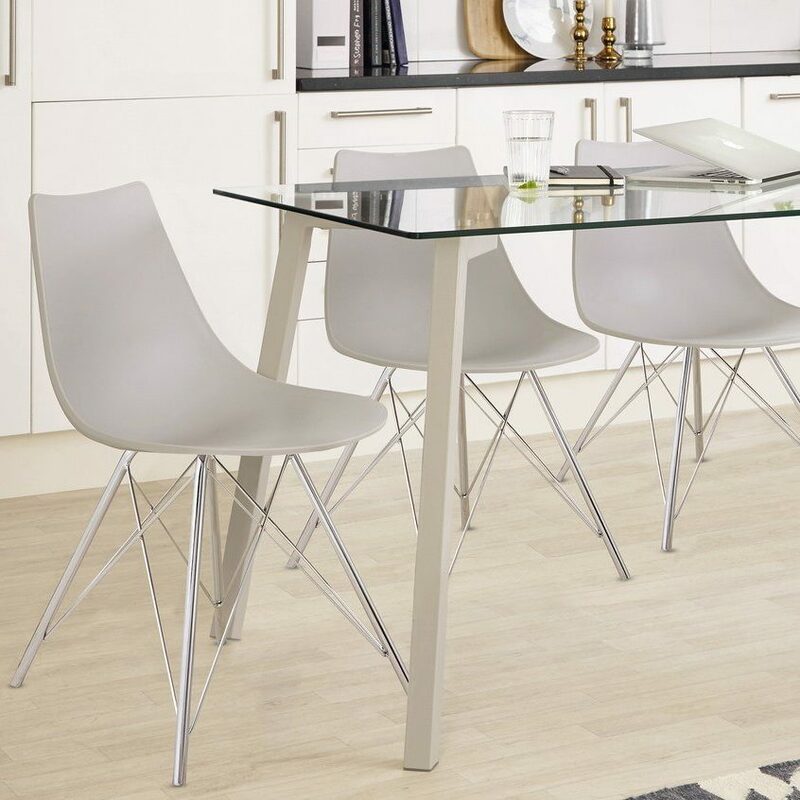 A dining bench set is a simple but really effective way to update your dining space. 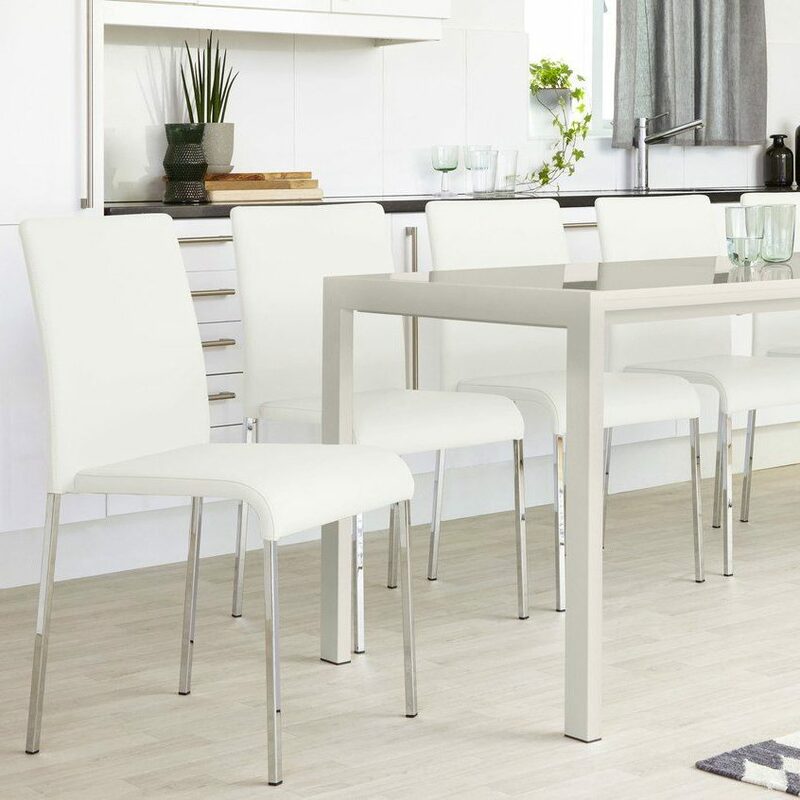 Comfortable, efficient and flexible, after reading this post you’ll wonder why you hadn’t considered a dining bench set sooner! Whether you have a formal dining area or a casual kitchen/dining room space, a dining bench would be a very smart choice. 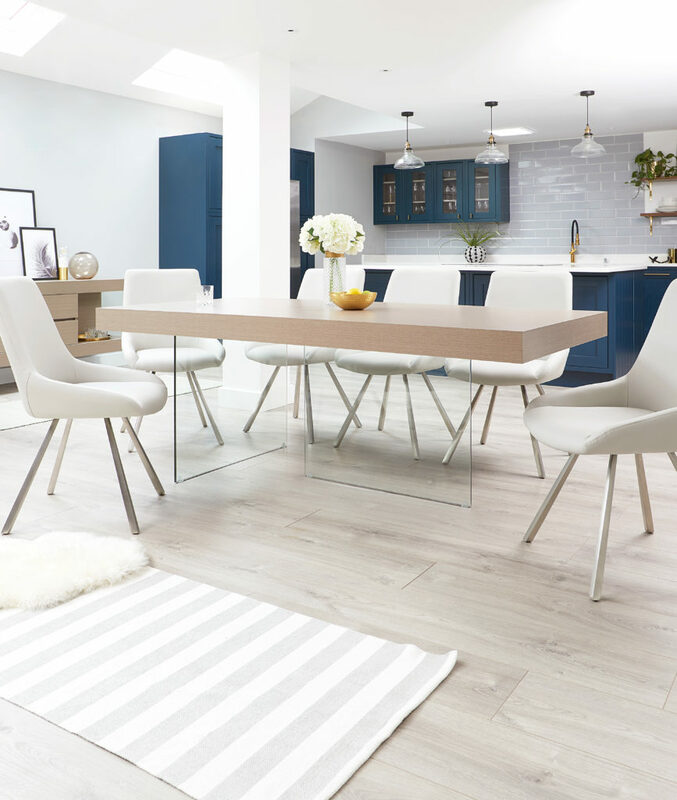 So, let us take you through the different shapes and styles of kitchen bench, the measurements you really shouldn’t miss, and the matching dining tables that will create a stunning dining bench set in your home. Why Choose a Dining Bench Set? 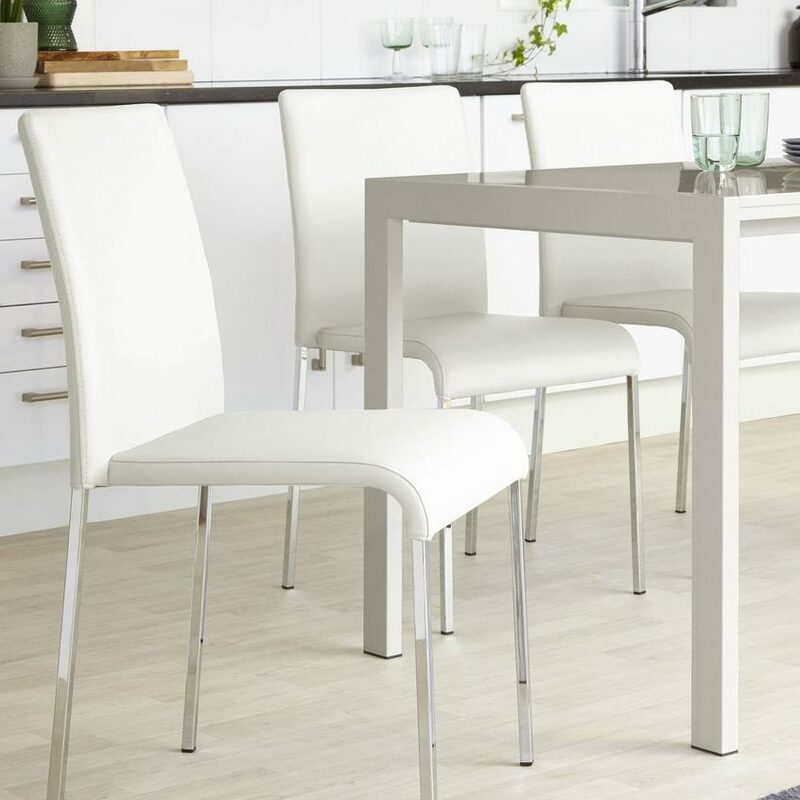 It’s more economical: this, of course, depends on how large your table is, but the cost of your dining chairs can really add up. A dining bench will allow you to seat just as many, if not more, all on one cosy seat. 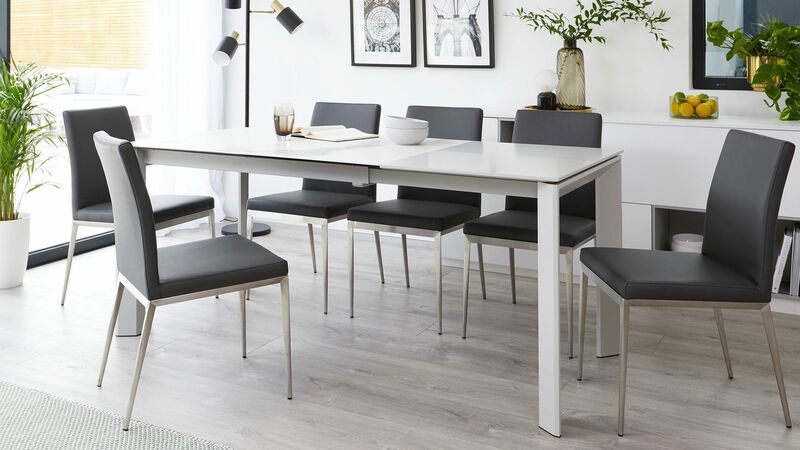 It’s a more versatile seating arrangement: whether you opt for a backless bench, a bench with a back or a corner unit, a dining bench will allow you to really transform your dining area. 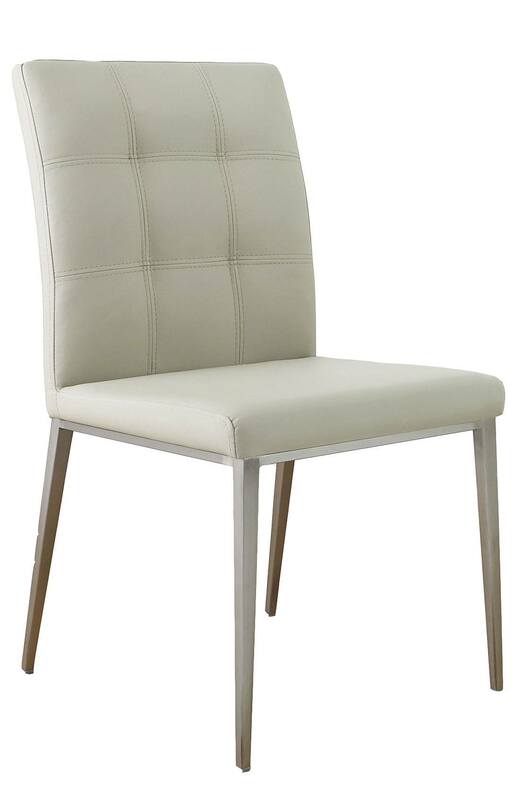 You could also pair a dining bench alongside dining chairs for a mix and match seating setting. 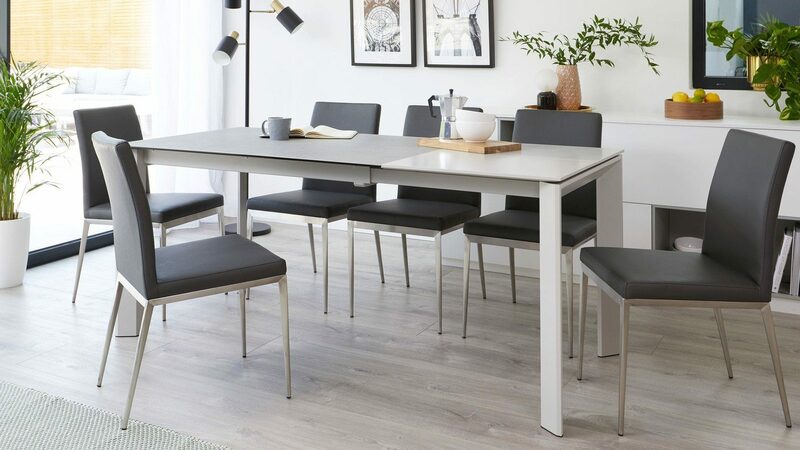 It saves space: you can often tuck a backless dining bench under the table and out of the way if you need more floor space, making a backless bench a great space saver. With a dining bench you can also seat a couple more when you have guests over for dinner, so you don’t need to pull up any extra dining chairs or huddle around the table. If you’re choosing a premade dining set, all the bench shapes and table sizes will be matched for you. However, it’s still good to know your key measurements and how much space you’ll need in your kitchen or dining room. Seat back height (which is all the way to the top if your bench has a backrest). Seat height (from floor to the seat). 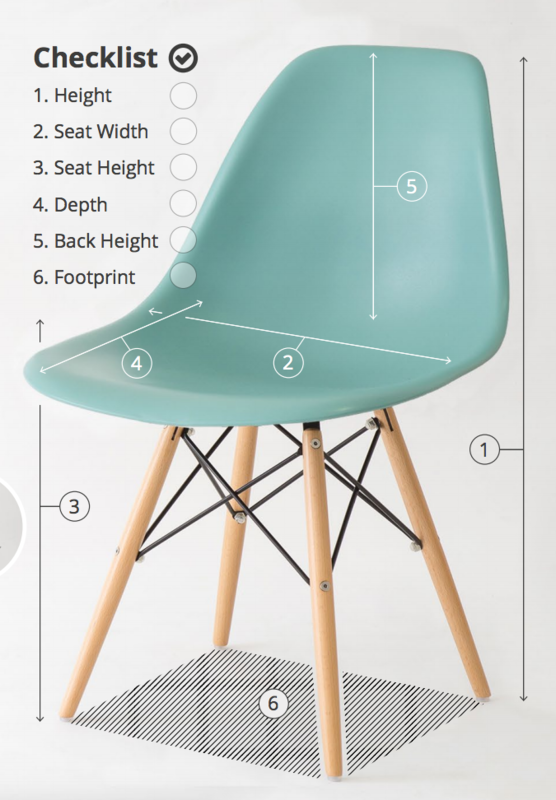 A comfortable seat height should be around 45cm, the same as a dining chair. Top Tip: If you’re planning to put your bench against a wall be sure to check that it fits with any panelling, radiators or window sills. 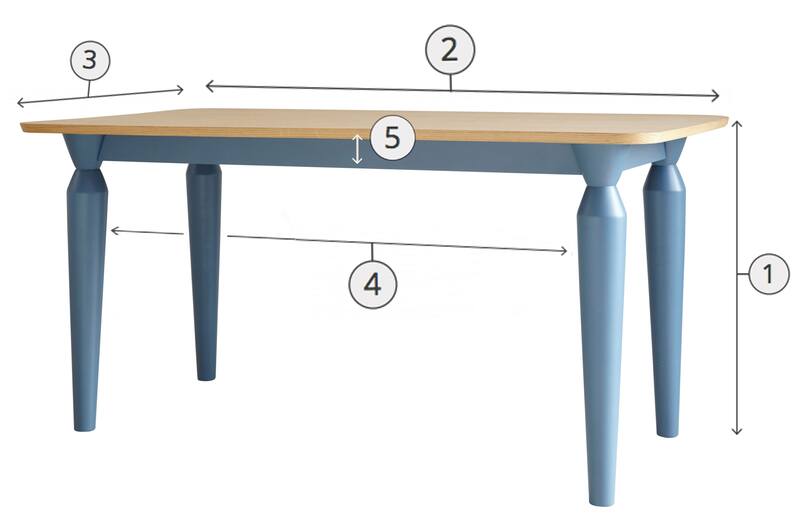 Table measurement from between the legs (not just the table top). 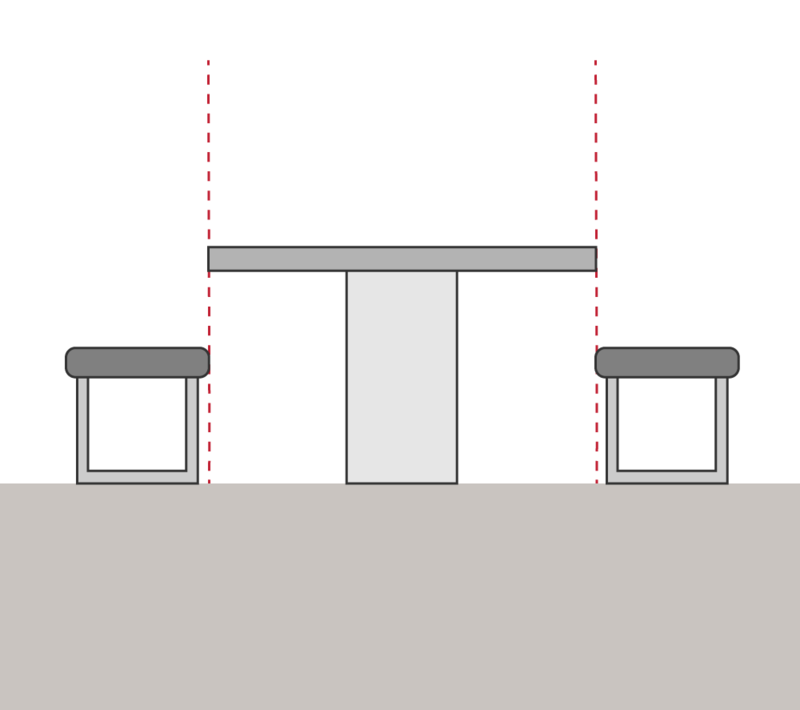 Top Tip: You should aim for your bench to be roughly the table measurement from between the legs, or minus 5-10cm if you want to tuck the bench underneath the table. 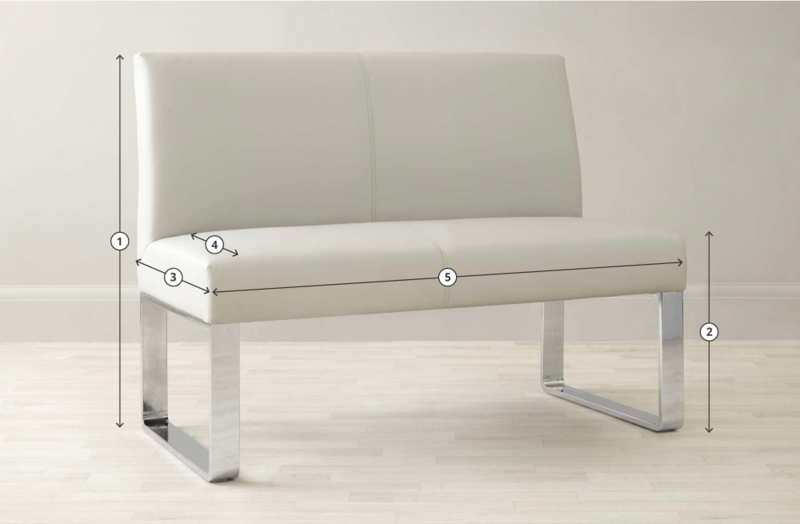 There are a whole variety of benches available, so it’s key to pick one that’s right for you and your space. 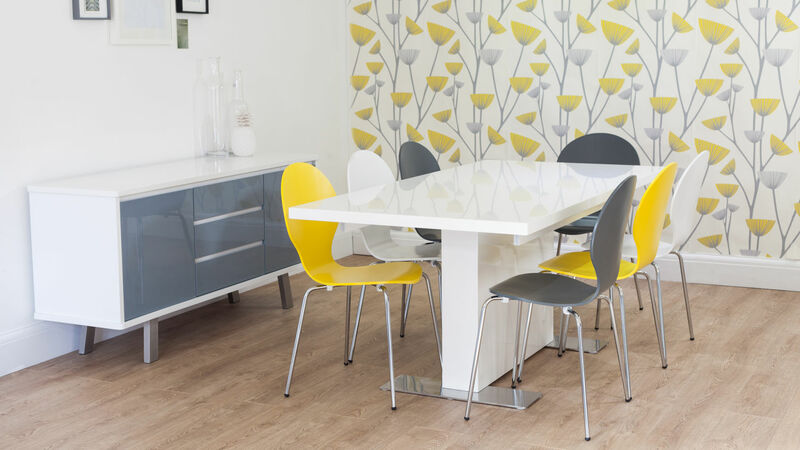 Dining benches are a great opportunity to really make the most of your dining area and transform its look. 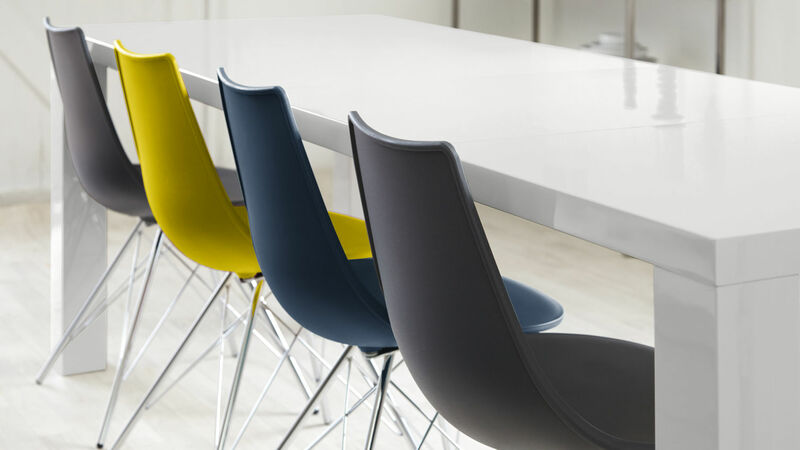 Here are our dining bench top picks and what features you should look out for. 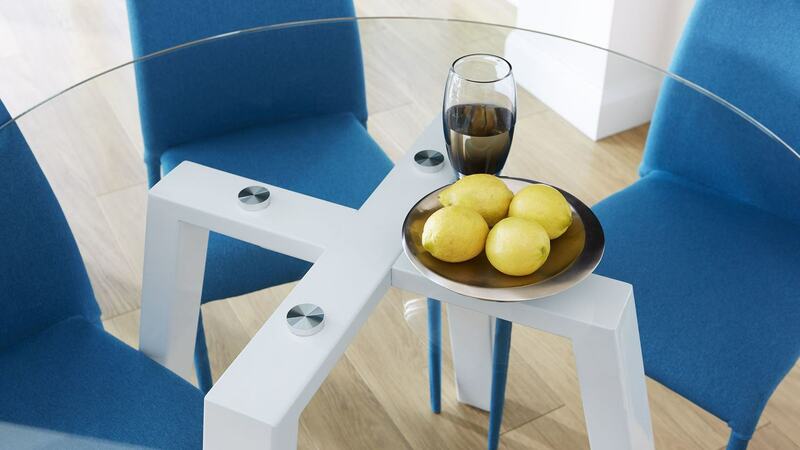 Great For: maximizing the seats around the table. 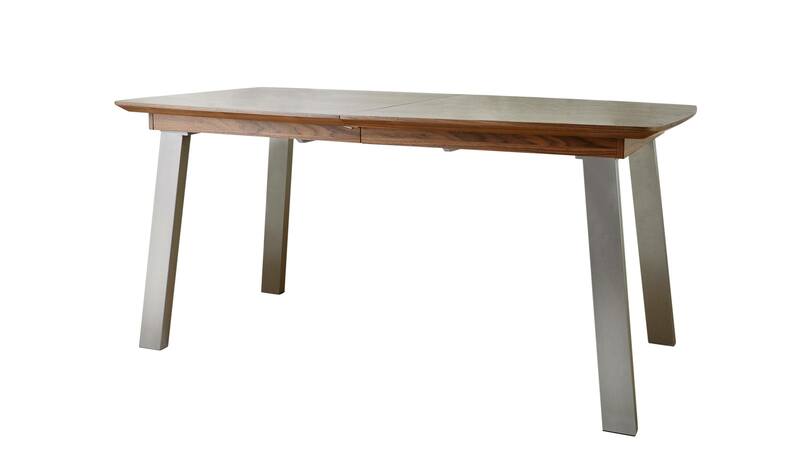 A full-length kitchen bench does what it says on the tin - it needs to be the full length of your dining table. 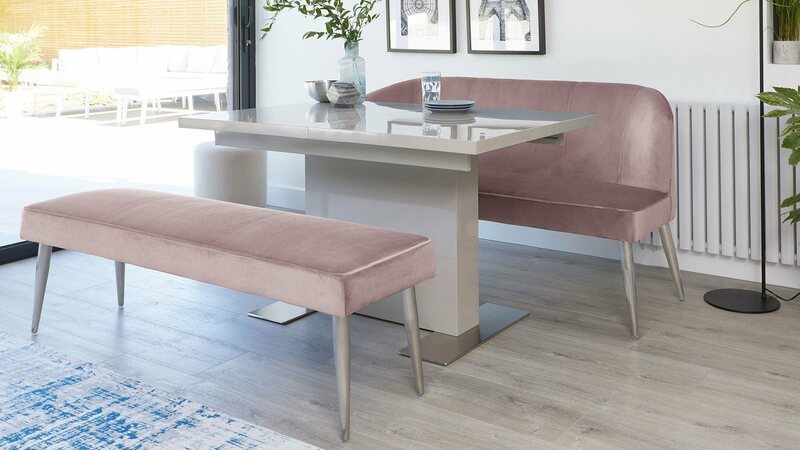 This style of bench works especially well with pedestal dining tables or where the table legs aren’t set at each of the four corners, as you can neatly tuck the bench in while still maximising your space. 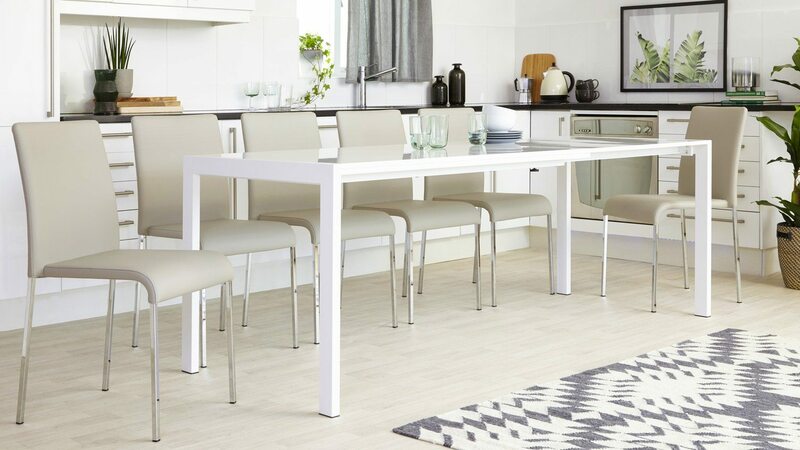 That’s not to say a full-length kitchen bench doesn't look great alongside a table with legs, just consider how you will be able to sit on the bench and if the table legs are in the way. Great For: space saving and a neat compact look. This really isn't one to miss! 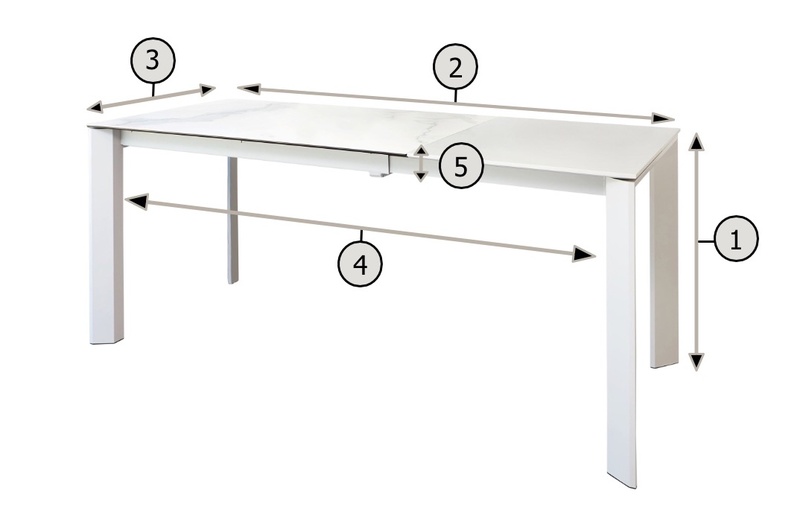 make sure you measure inside the table legs as well as the table top. 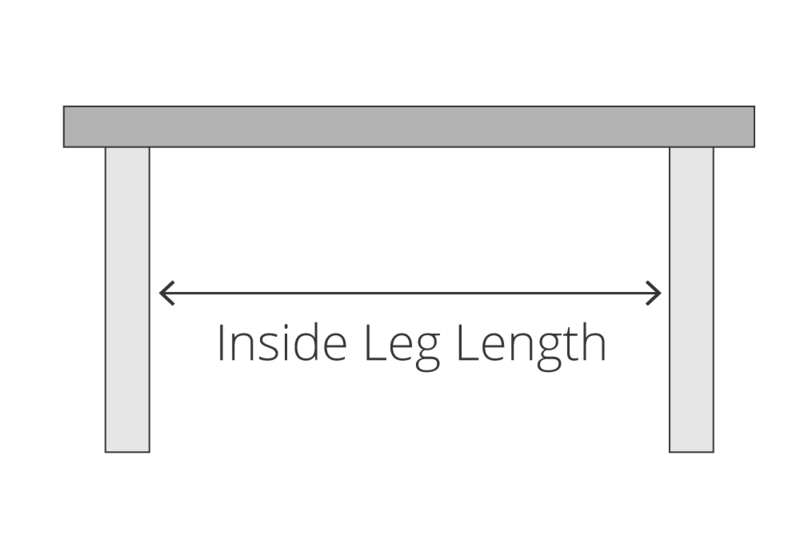 To be able to tuck your bench underneath a table with legs, the bench will need to fit the ‘inside leg length’ measurement of the table rather than the length of the tabletop. You’ll also want to leave about 5-10cm for clearance to avoid bumping into the legs every time the bench is pulled in and out. 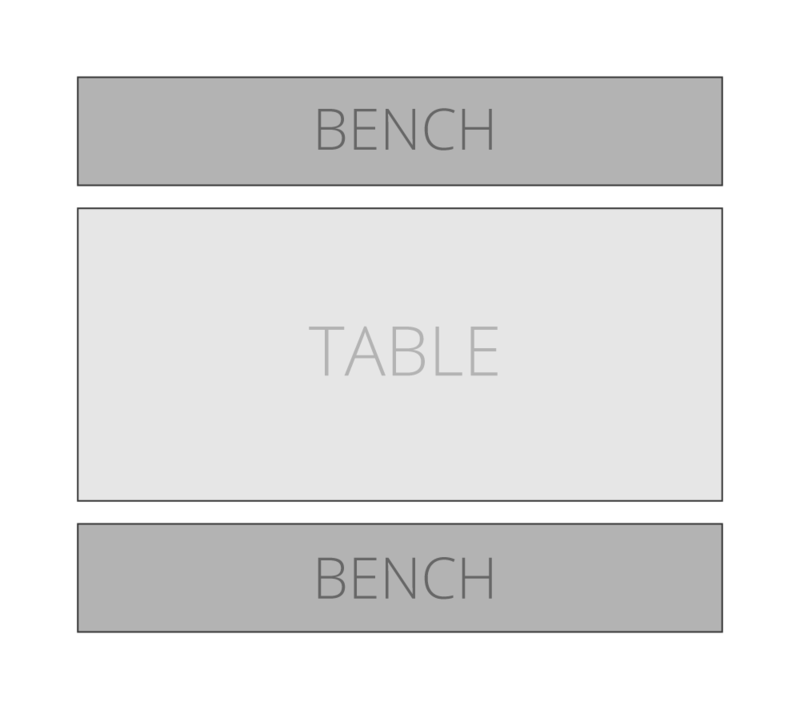 Top Tip: Whether you have your bench tucked in or at the full length of your table, we recommend that you allow enough space so that when you are sitting on the bench, the front of the bench is in line with the front of the table. This applies to corner benches as well as it will give you the optimum comfort while seated. You may prefer to have a more tucked in seating position, but this will make sure that you always have enough room. Great For: creating a cosy dining corner. 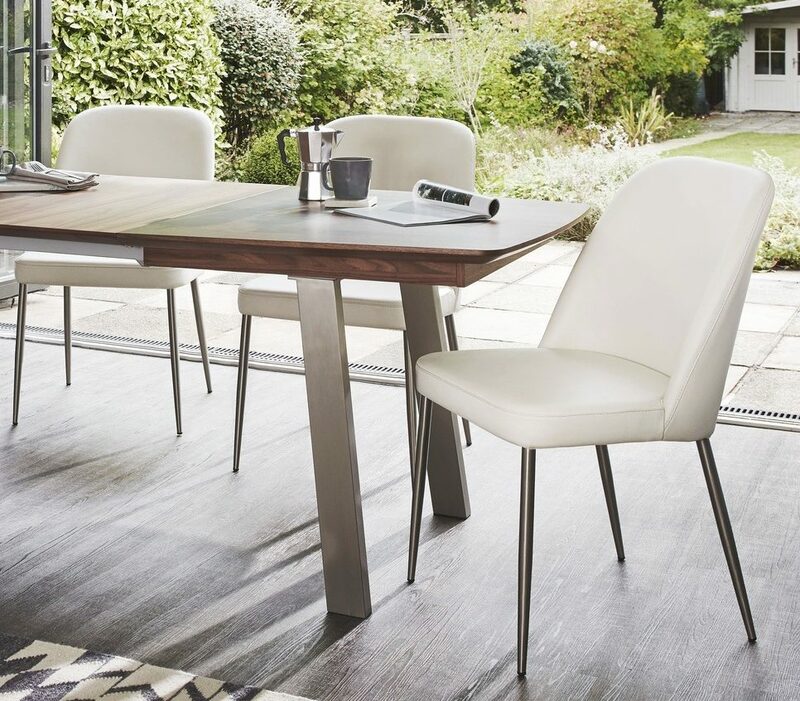 Corner dining benches are designed mainly to suit tables with pedestal legs, such as our Sanza and Aria tables. That’s not to say that they can’t work with tables with legs though! 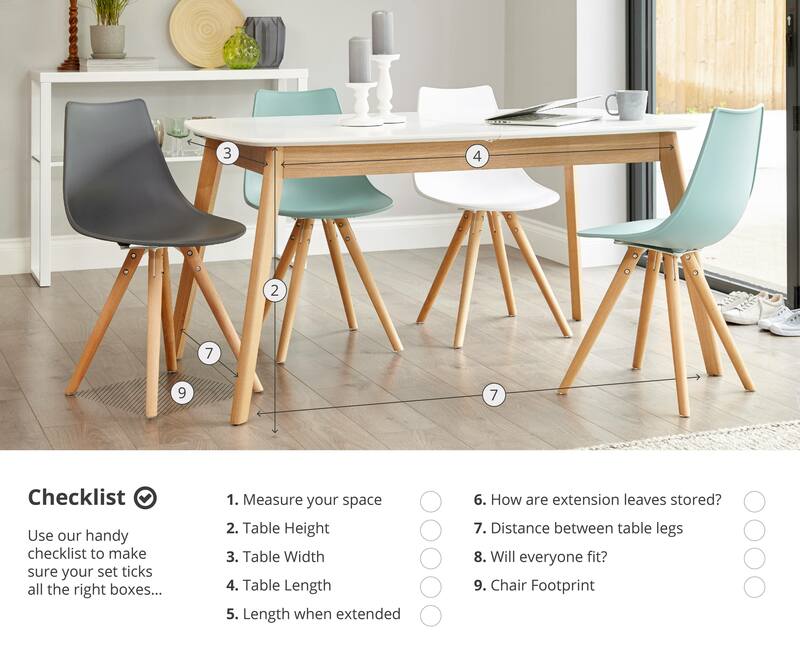 In this case, you’ll really need to consider your sizing and check there’s enough space to fit around the table legs and be seated comfortably. 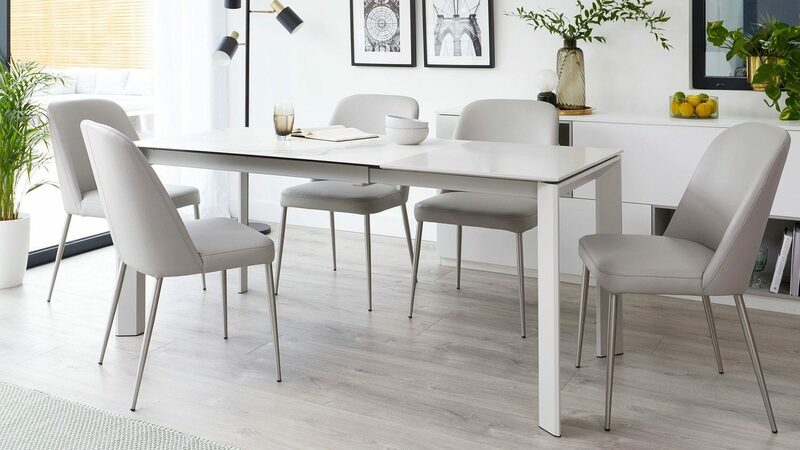 Top Tip: It’s called left-hand dining bench because the longer side is on the left and a right-hand dining bench because the longer side is on the right! Great For: comfortable and versatile dining. 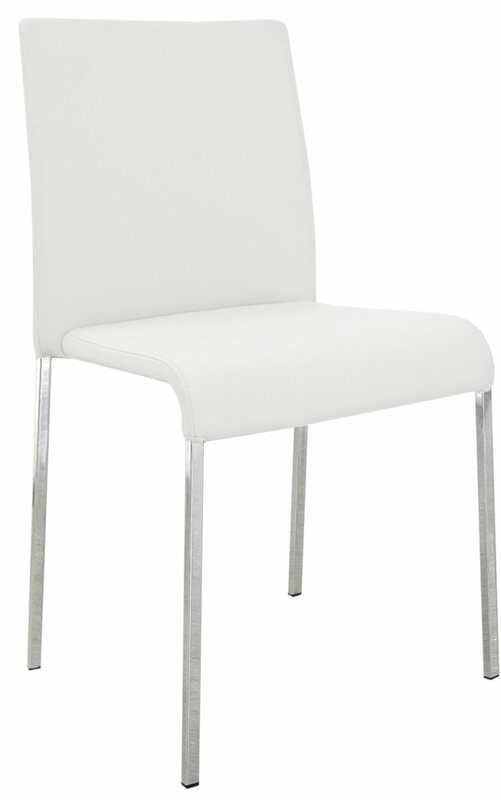 Clean-lined and simple, a straight back bench offers more back support as you can lean back when you are seated. Benches with a back create more of a visual impact in a room, which is great if you’ve got the space and are really looking to add a style statement in your dining interior. 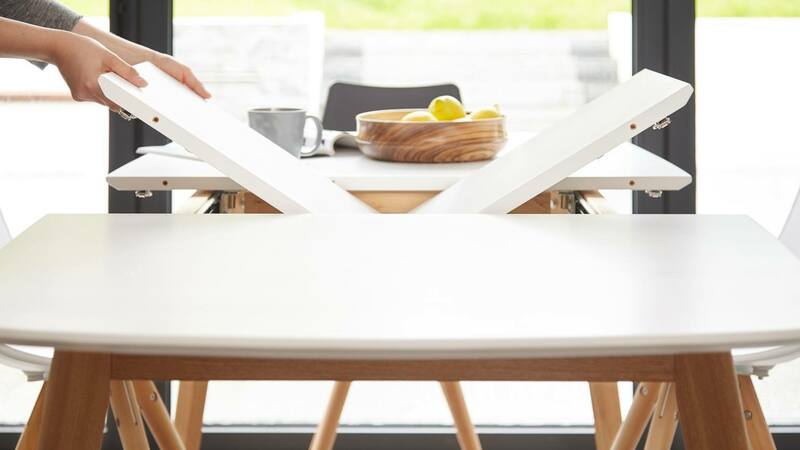 A dining bench with a back also allows you to squeeze on a couple more, even if seating does become more snug! 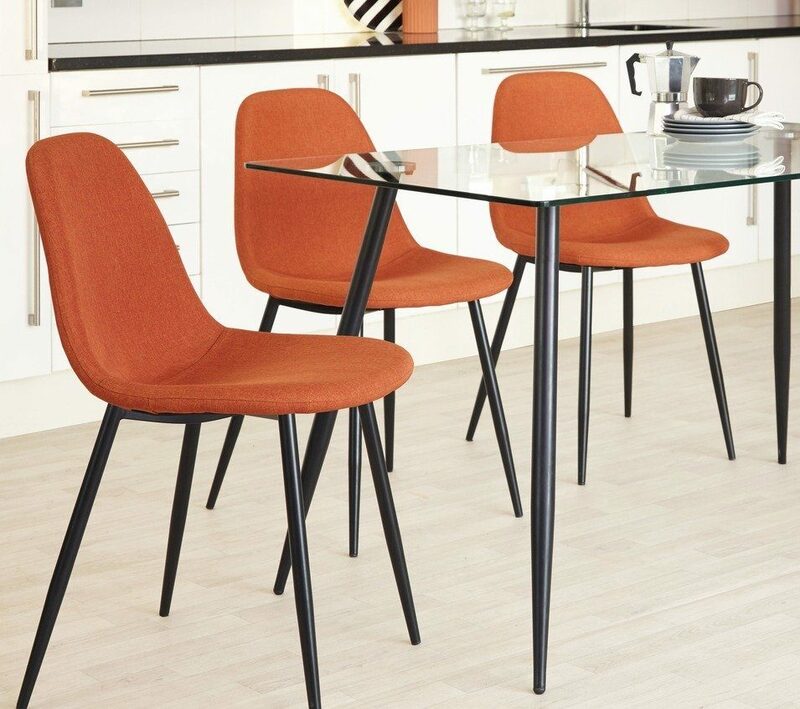 Great For: opening up the look and feel in your dining area. 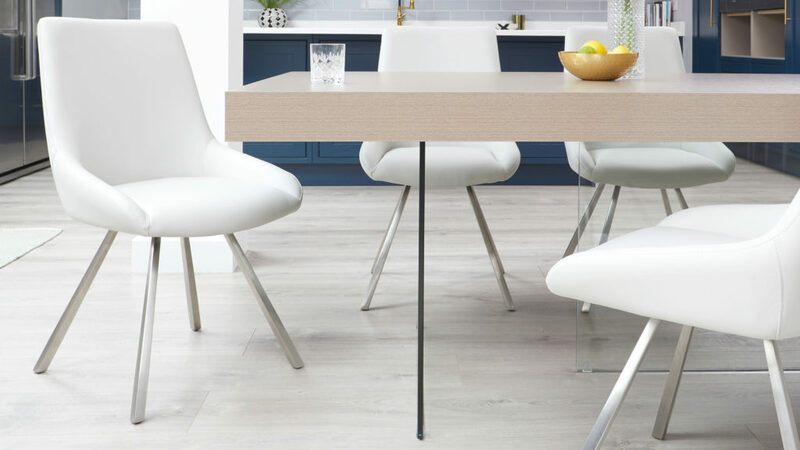 Backless dining benches are great for opening up your dining space as, without a back, they have less of a visual impact in the room. 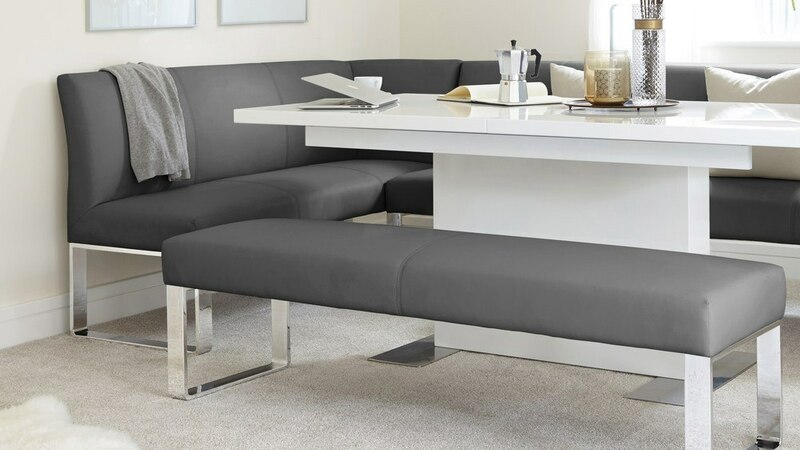 They’re also great space savers too; if you select a bench size that’s smaller than the inside leg length of your table, you can neatly tuck the bench away when it’s not in use. 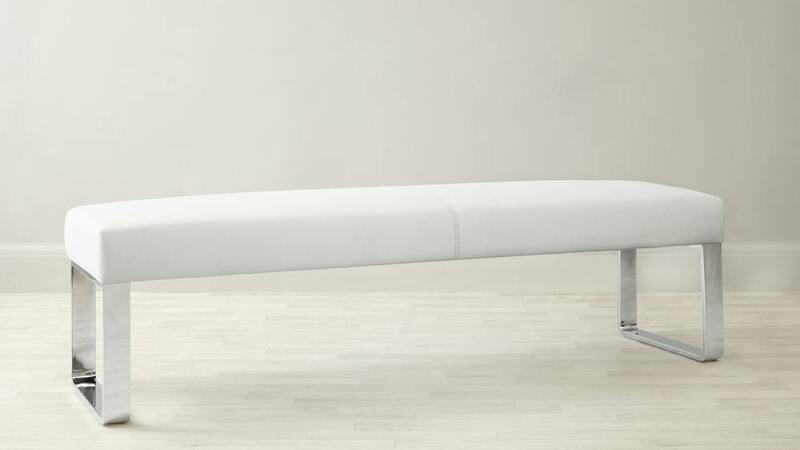 Backless benches are also that bit lighter and easy to move. A corner nook is a perfect opportunity to have a corner bench in your home. A corner bench will really make the most of an awkward corner and turn into a cosy and communal dining spot. Alternatively, you can use a corner bench to section off a dining area in an open plan kitchen or kitchen/dining area. Our range of Loop 5 and 7 seater left and right-hand corner benches would work a treat! 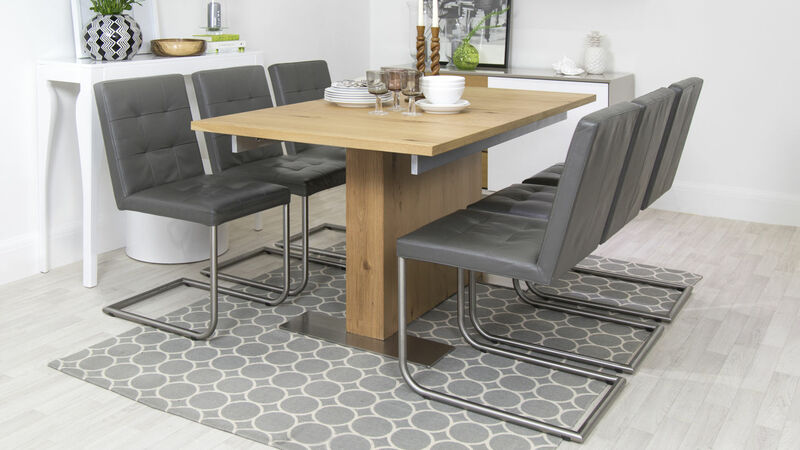 A dining bench is a great match with an extending dining table, as with a bench you can be a bit more flexible with your seating, even if it does become a slightly more snug! 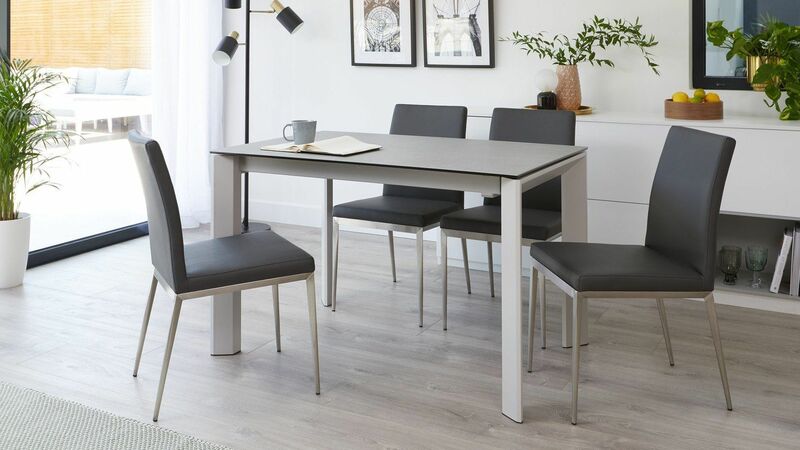 This is an ideal dining bench set option if you want the flexibility of a table extension but don’t have the space to store extra chairs when they are not in use. A great way to make your new dining bench set look right at home is to coordinate it with other furniture pieces in your space. 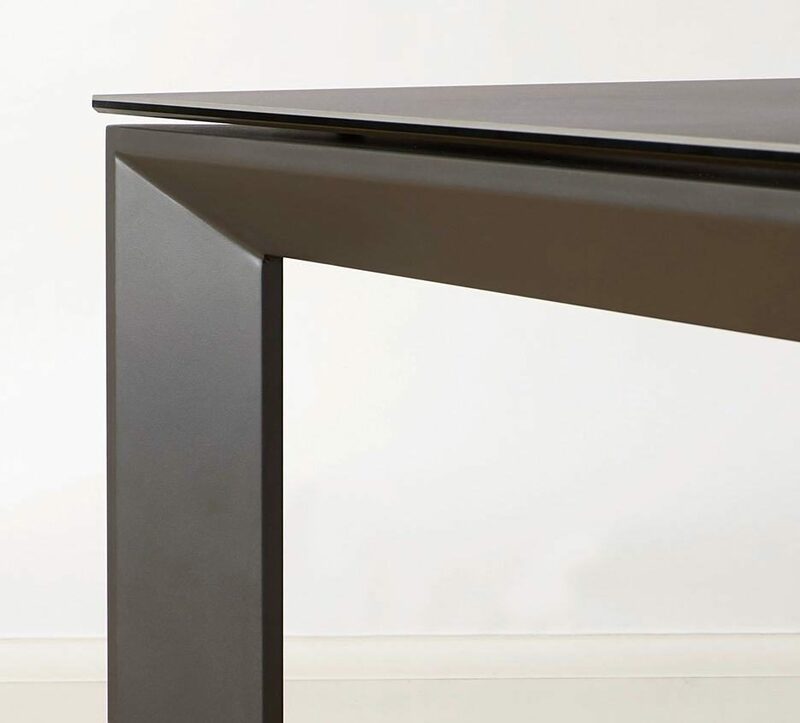 Here we’ve coordinated the black powder coated legs of the Mellow bench with the sleek black chrome base of the Elise Black Chrome Bar Stool. 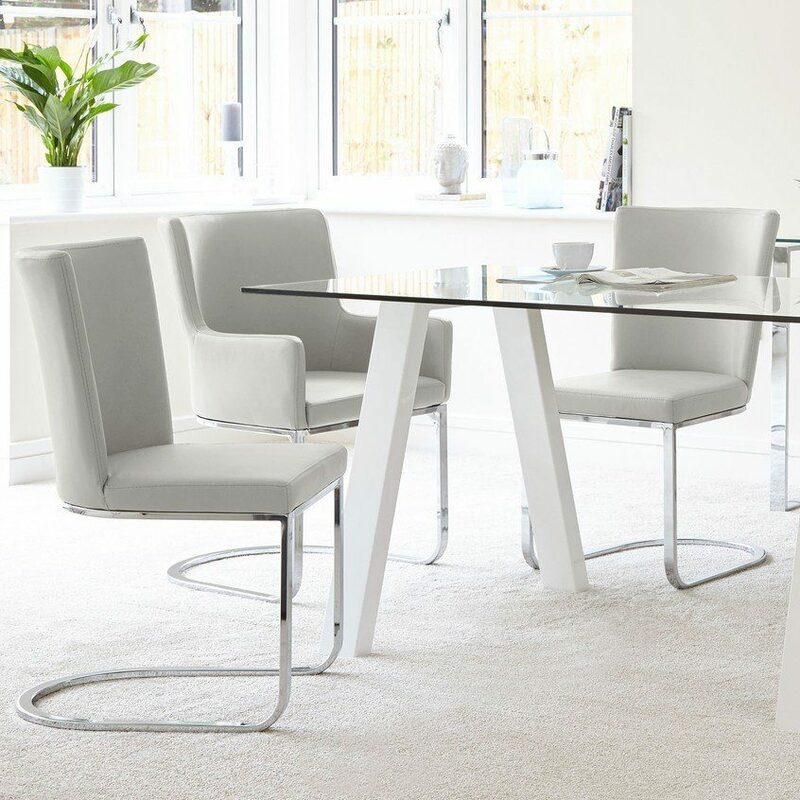 The Zen 6 Seater White Gloss and Glass Dining Table ties the whole look together by breaking up the darker finished, keeping the space looking light and modern. Chances are, you’ll be using your dining benches daily. This is why we recommend doing a light, regular clean of your benches. This will help to keep away any marks caused by day to day use, keeping your bench looking newer for longer. When it comes to cleaning any marks and spills caused by food and drink, step away from the bleach! Bleach is a harsh chemical cleaner that will just damage the leather rather than help to clean it. Instead, opt for gentler cleaner agents such as a dab of mild detergent like washing-up liquid on a soft, slightly dampened cloth. Apply a gentle amount of pressure and move in a circular motion. Then with a dry cloth, wipe the faux leather to remove any excess moisture. 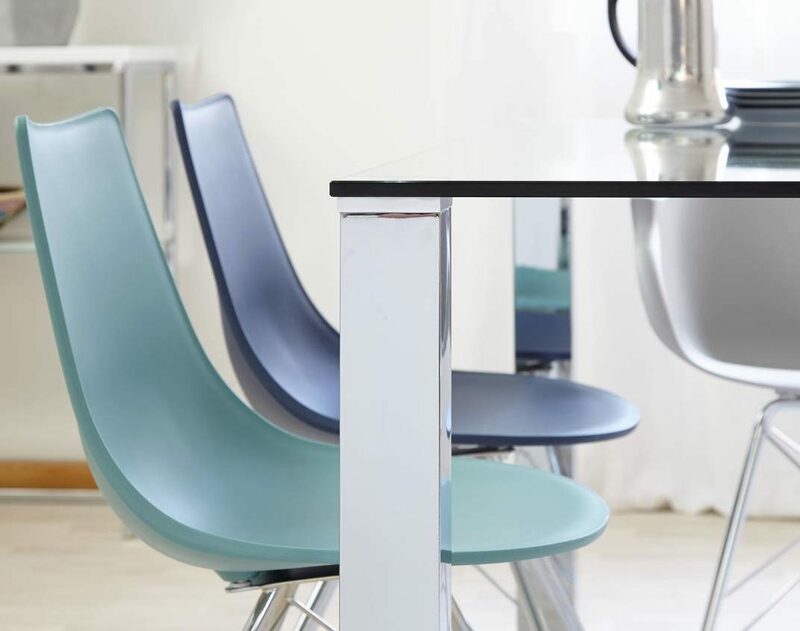 For the chrome base or legs of your dining bench, we advise using soap and water on a soft cloth, and if the mark still doesn’t go away, try adding a splash of vinegar. This will help to give your cleaning that extra boost. Waxing chrome after cleaning will help to keep its high shine for even longer. 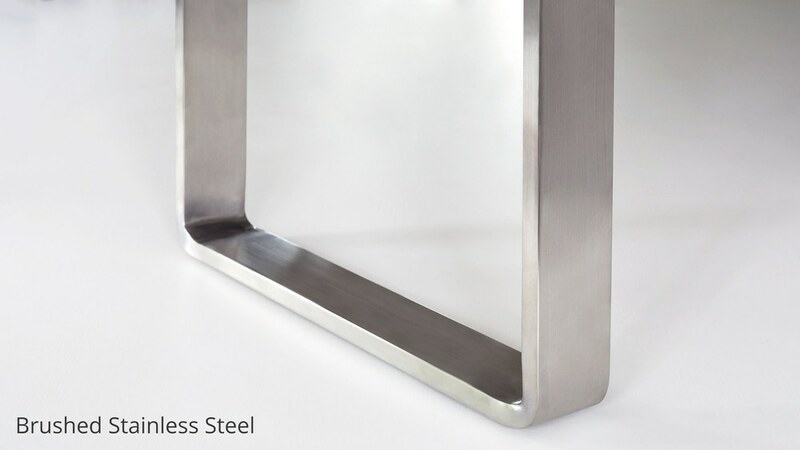 Avoid using abrasive materials on your chrome dining table or benches. Any scratches caused can potentially expose the material to the air, subsequently resulting in rusting over time. Much like chrome, all you need to clean brushed metal or stainless steel is a mix of warm water and mild dishwashing detergent. For those harder to remove marks, window cleaner or a solution that’s half water and half white vinegar works a treat! Alternatively, you can use baby oil on a paper towel, being sure to buff away any excess solution with a dry, microfibre cloth. 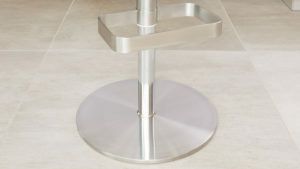 Dust your brushed metal bench legs regularly to keep it looking newer for longer. To clean black powder coated benches, prepare a bucket of soapy water by adding a few drops of mild liquid detergent to warm water. Then, dip a lint-free the rag in the soapy water and wring out excess. Gently wipe the entire surface, remembering to wash underneath the furnishing and in all cracks and grooves. Never use ammonia or bleach on powder-coated furniture and avoid scraping or rubbing the surface with an abrasive cloth. This could damage or remove the coating from the surface rather than help to remove the mark. 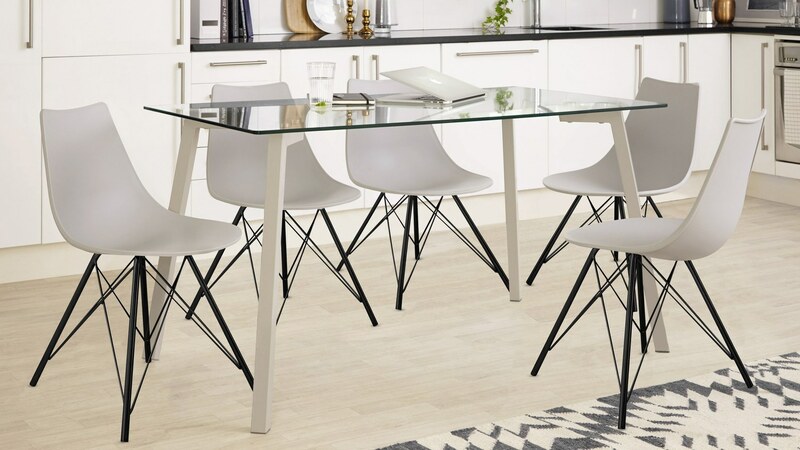 So, have we convinced you that a dining bench set would be a great addition to your home? We hope so! If you’d like more information on bench sizing and styling, we highly recommend taking a look at our all-you-need-to-know Dining Bench Sizing Blog Post. Or, just ask us a question in the comments! 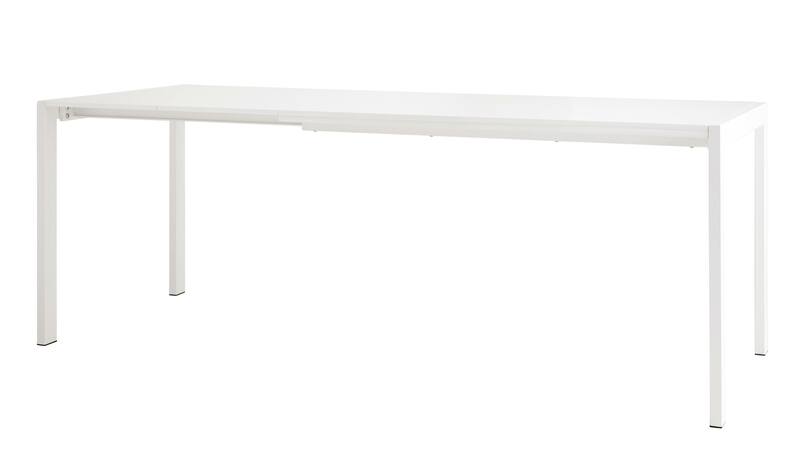 Already have a Danetti bench, table (or both!) in your space? We’d love to see! Show us your style by posting a picture on our Facebook or Instagram pages. Don’t forget to #mydanetti.